The “city that never sleeps” needs a transit system that never sleeps. 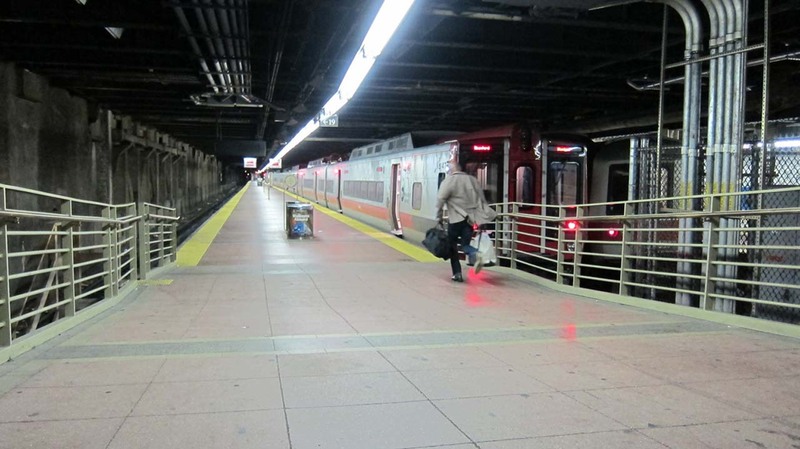 The region’s vitality and economy depend on safe, reliable subways, buses, and trains. And they in turn depend on the men and women of the MTA’s operating agencies who help us get where we need to go, day after day, week after week, 365 days a year. But what happens when it’s not just a regular day, when it’s not a simple commute to work or school? What happens when crisis hits the city? 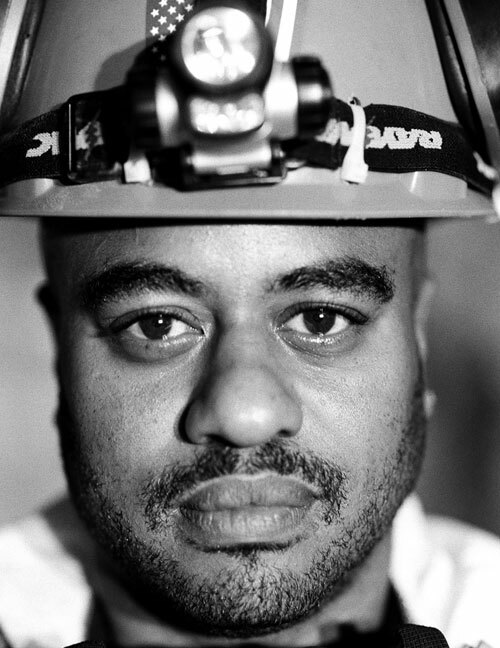 When terror strikes, when storms hit, when blackouts darken the region—that is when we feel the true contribution of transit workers to the life and vitality of the city. When a bus driver helps evacuate a nursing home before a hurricane. When a train conductor escorts frightened passengers to safety during a power outage. When a crane operator helps clear debris after a terror attack. 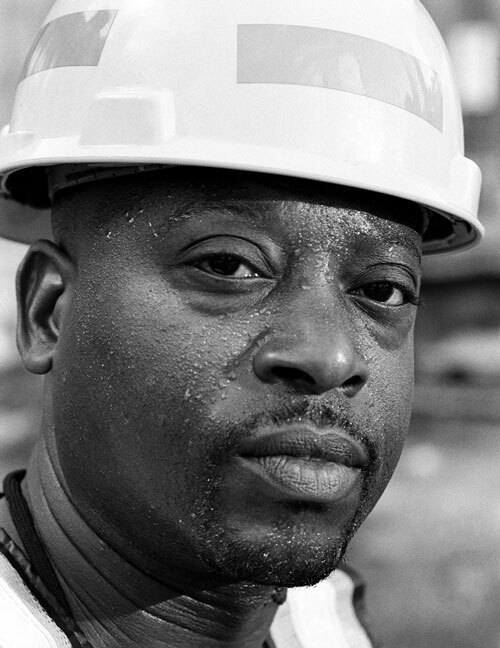 When disaster strikes, it’s up to these dedicated workers to get the city moving again. 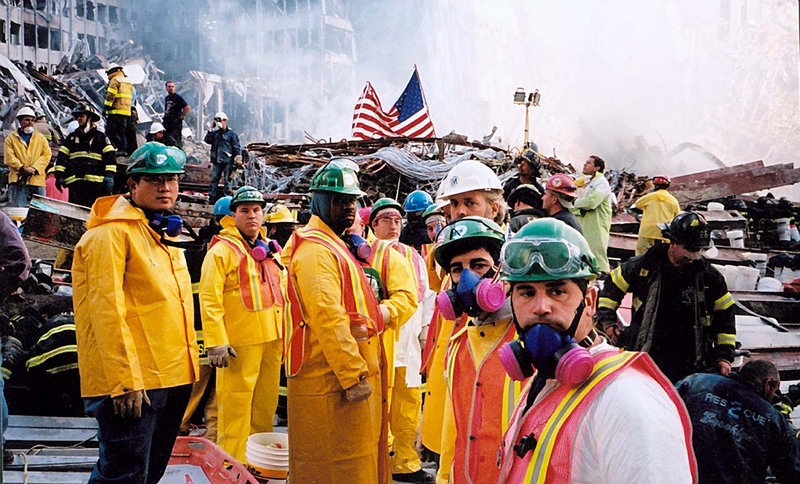 From storms, blizzards, and blackouts to the terror of September 11, 2001, their stories are striking examples of resourcefulness, resilience, and heroism in times of crisis. 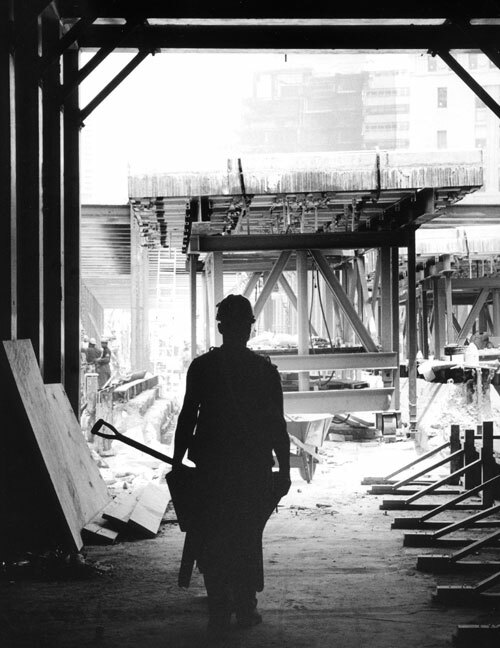 The impact of the September 11 attack in New York City was unprecedented. So too was the heroic response of MTA employees. Bus drivers. Track workers. Superintendents. Electricians. Mechanics. 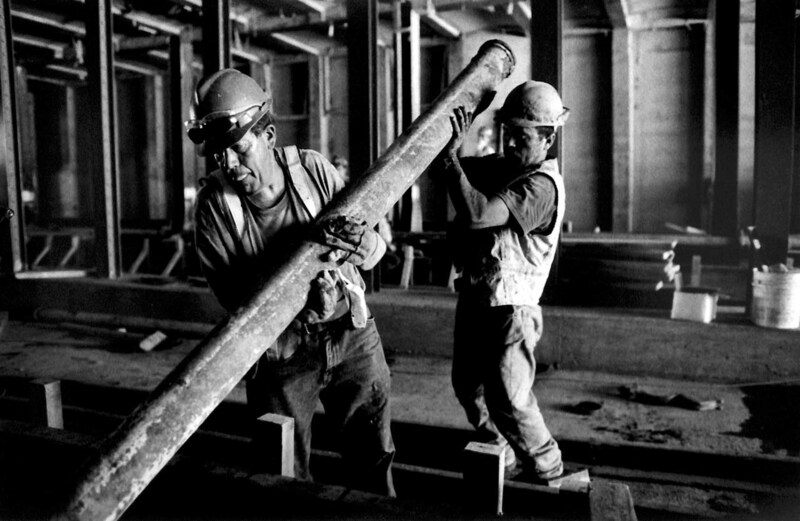 Workers from across the transit system contributed their unique skills, equipment, and knowledge of the city’s infrastructure. They evacuated frightened citizens, transported first responders, and proved an irreplaceable resource in the process of rescue and recovery. 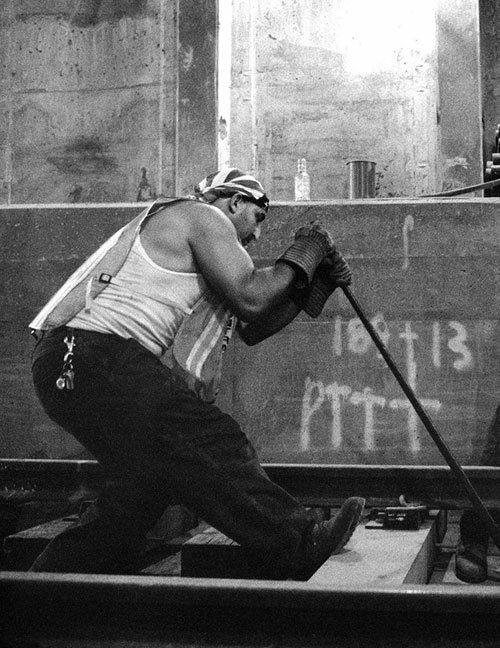 Their core mission, however, was to get New York moving again, as quickly—and safely—as possible. 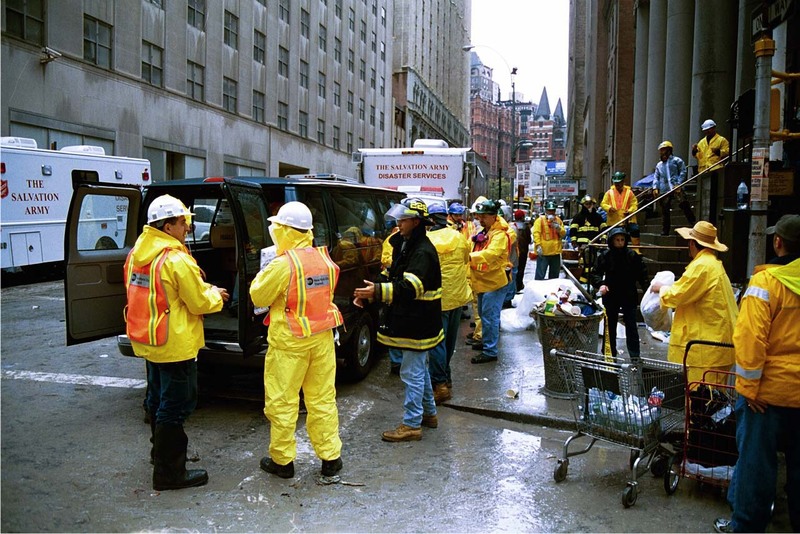 After the attack, transit professionals inspected tracks, cleared abandoned vehicles, and published daily maps as planners improvised new routes through Lower Manhattan. When news came of planes striking the World Trade Center, nobody was certain exactly what was happening. 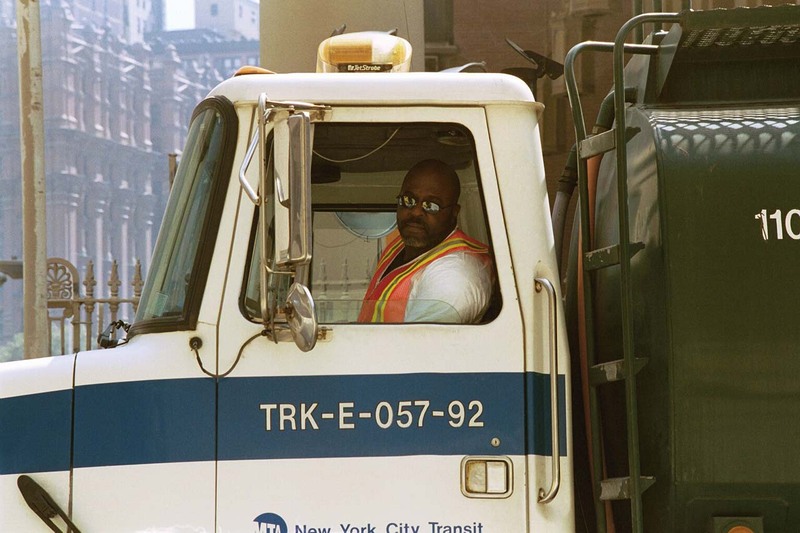 Like all New Yorkers, transit workers were shocked and confused. But they did know one thing: they would be needed. Those off duty or on break hurried back to their posts. 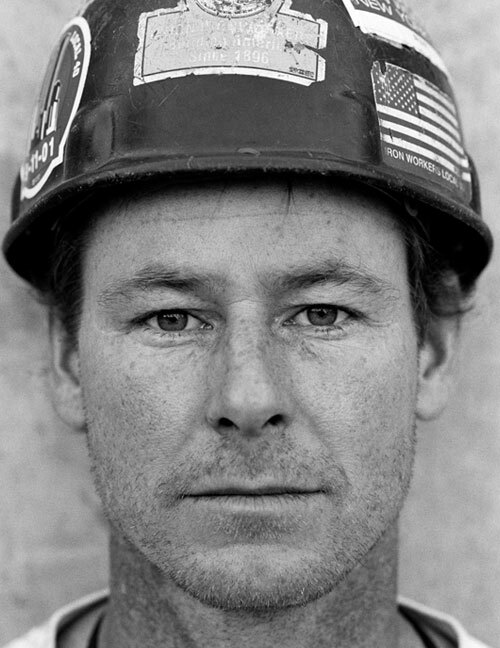 Many who were at home rushed to work, or made their way toward Ground Zero, ready to help however they could. What had happened? What was next? Were more attacks coming? 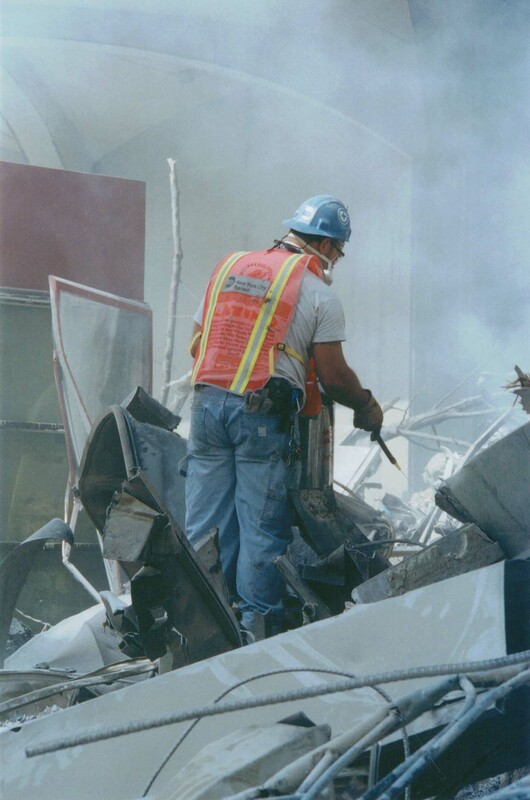 Little was known in the minutes following the first explosion on September 11, 2001. But one thing was clear. Public safety came first. Adapting to the situation as information poured in, managers at the Subway Command Center shut down the subway system. 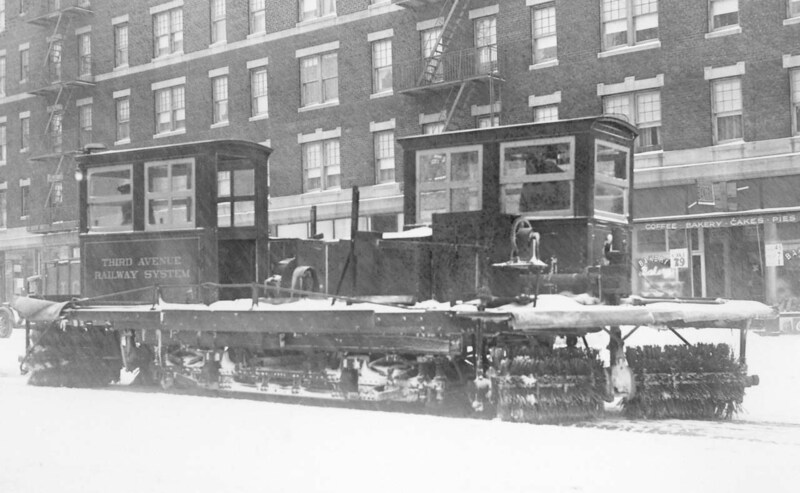 Almost immediately, crews began inspecting Lower Manhattan tunnels for bombs, and testing tracks with empty trains. Within hours, the first few subway lines were able to resume service. By the end of the day, 65% of the system was operating. 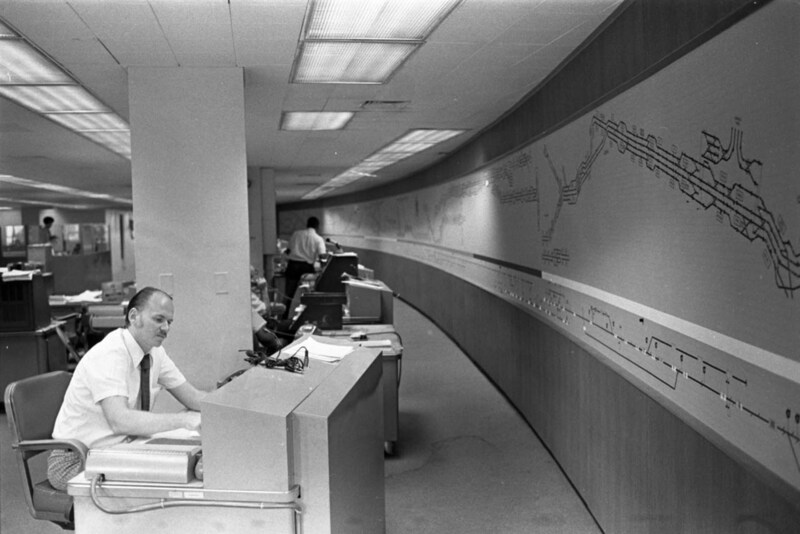 The Subway Command Center (now called the Rail Control Center) tracks train movements and communicates with workers in the field to keep the subways running smoothly. But at 10:20 am on September 11, they decided to shut down the system. 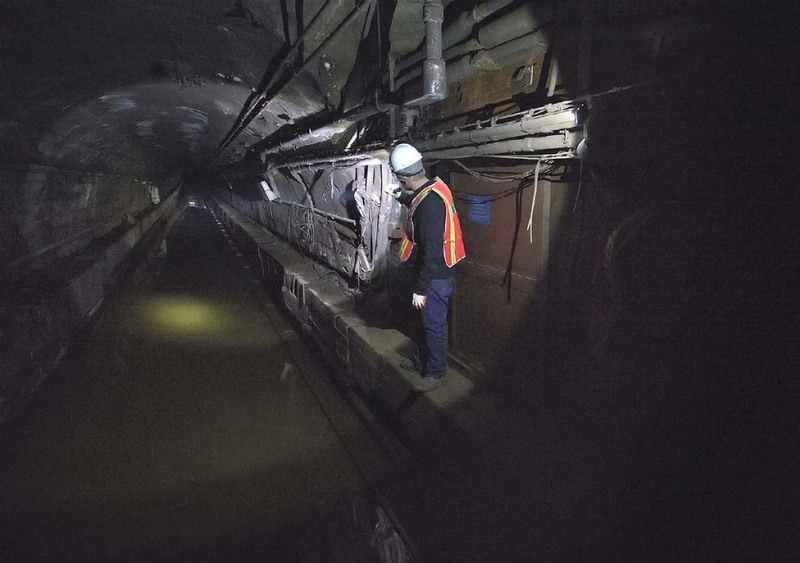 Damaged signals, third rail power disruptions, and water and debris in downtown tunnels severely hampered service in Lower Manhattan. But halting all subway service was primarily a safety decision. Officials were concerned about the possibility of additional attacks—and bridges and tunnels are high-profile targets. Once it was deemed safe to resume partial service, transportation planners used their knowledge of the maze-like subway system to devise new routes that avoided the crushed and flooded tunnels under Lower Manhattan. Imagine yourself sitting at this console on September 11, 2001. 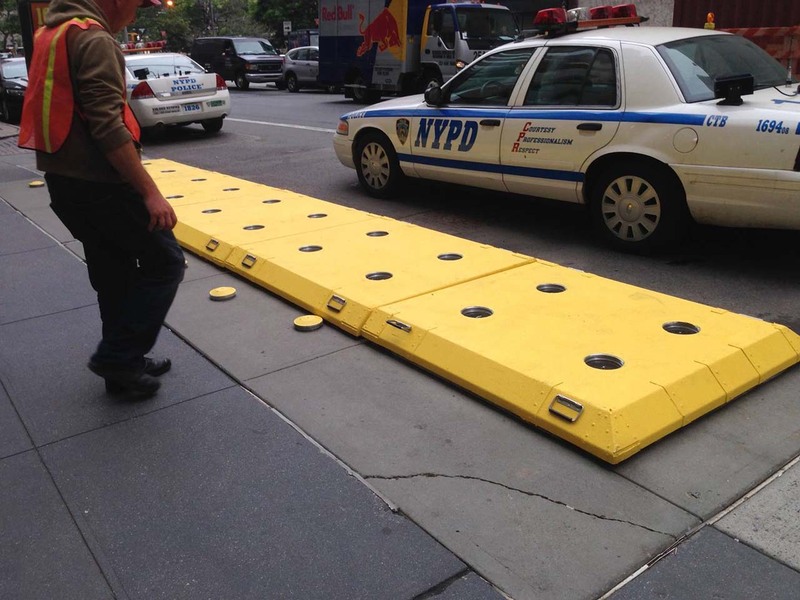 You’re receiving reports of dangerous conditions in Lower Manhattan. You are also getting reports of stranded passengers on platforms. Do you halt subway service? Or send extra trains to aid evacuation? 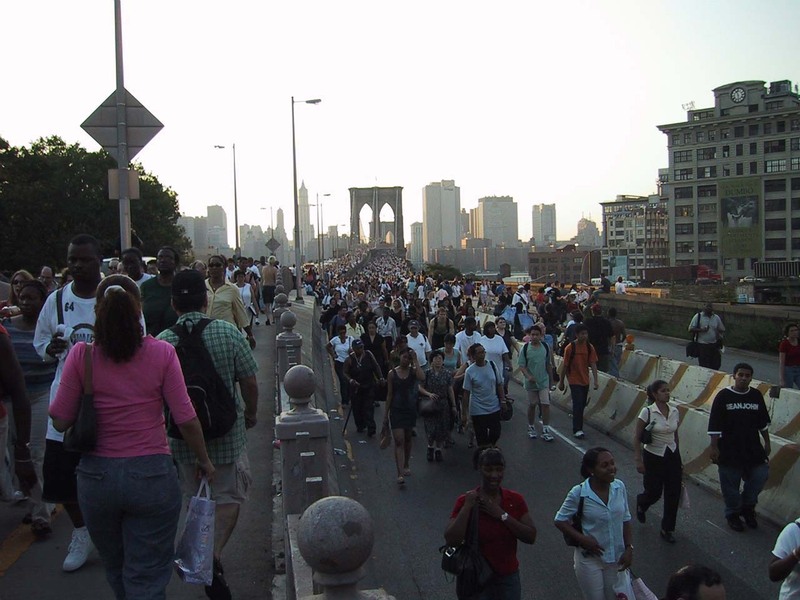 Above ground, Lower Manhattan is clogged with traffic. Yet there are people desperate to leave the area—as well as first responders and rescue workers desperate to reach the area. Do you send in extra buses? Or do you try to clear the streets? In emergencies there may be many competing options. What would you have done? 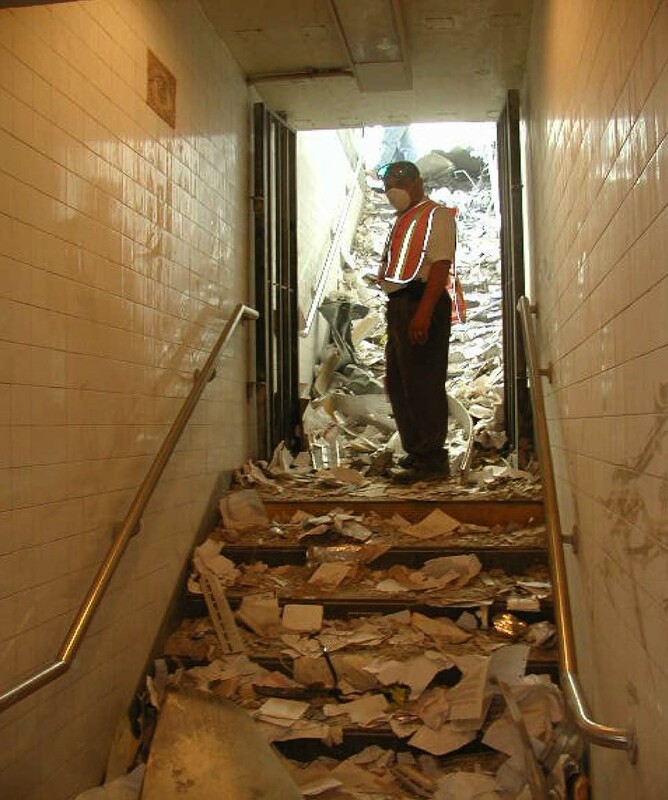 Almost immediately after the attack there were reports of dust and debris filling Lower Manhattan subway stations. Terrified passengers, crowded on smoke-filled platforms, were relieved as subway operators made final stops in Lower Manhattan and carried them to safety. 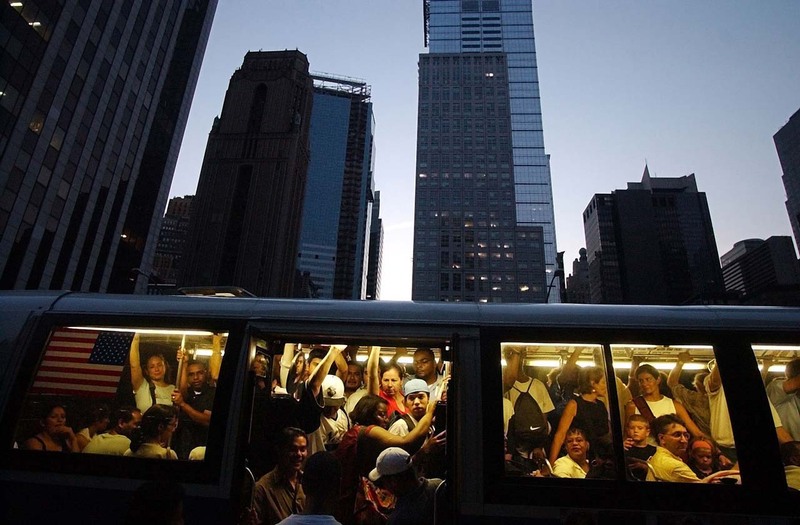 With subway service disrupted, New York City Transit rerouted buses to aid evacuation. 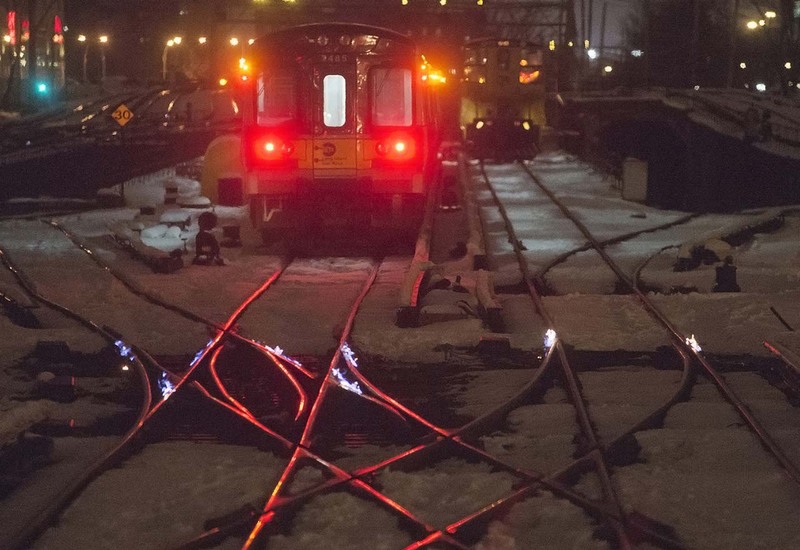 Metro-North and LIRR dispatchers put all available trains into service to get commuters home. 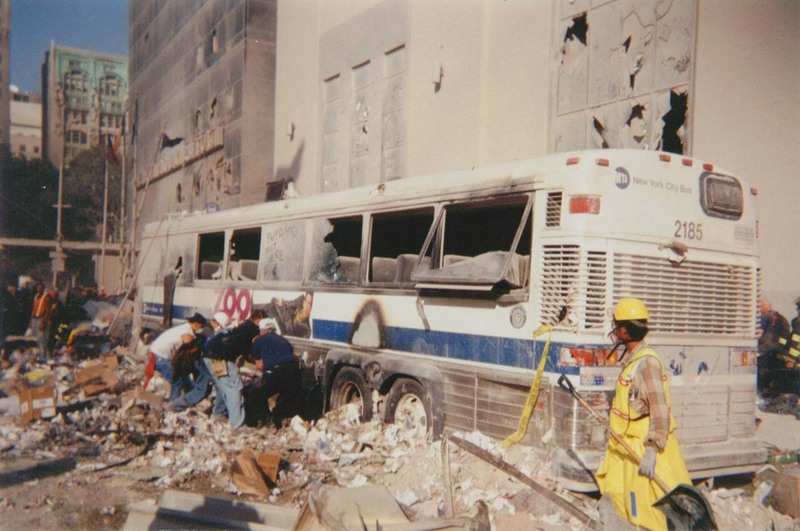 And hundreds of transit workers made their way to Ground Zero to join police, firefighters, and other first responders. The world saw the destruction in New York’s skyline and streets. 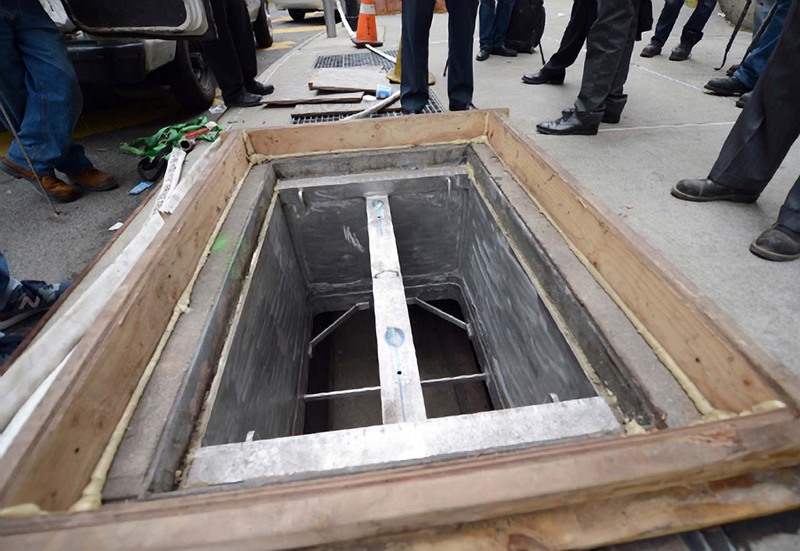 Subway workers and passengers also saw its devastating impact below ground. 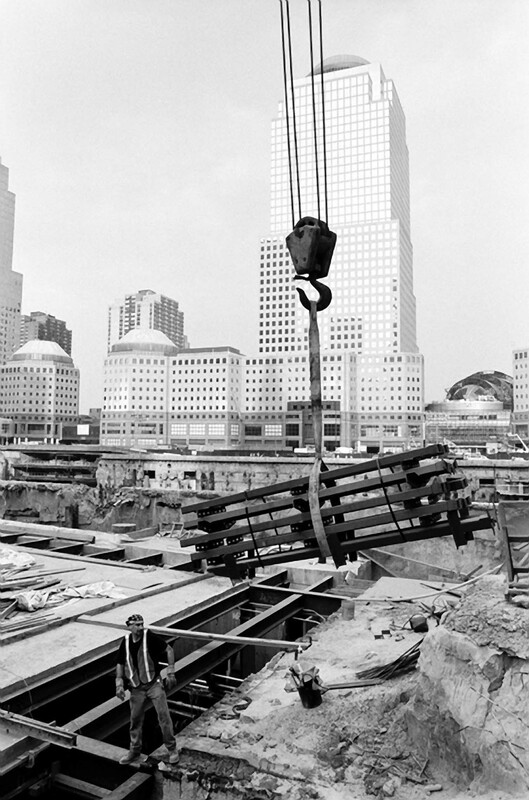 The falling towers crushed the Cortlandt Street Station. 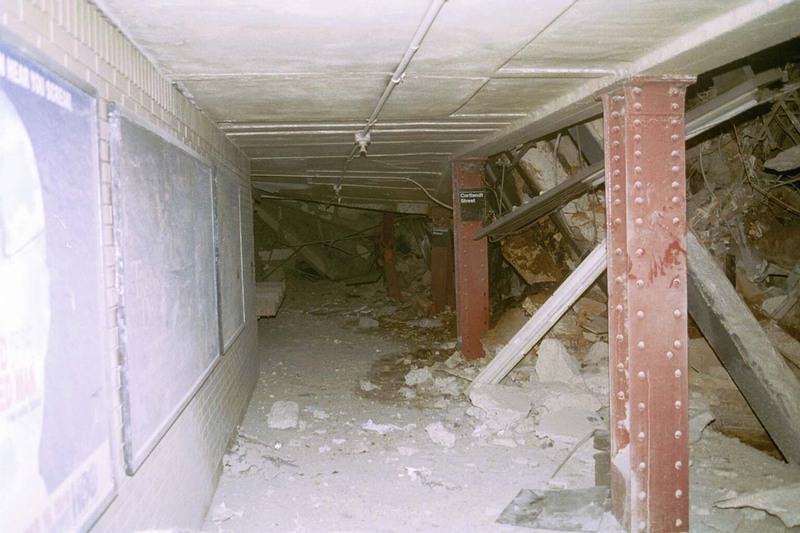 Massive building beams shot like spears through seven feet of earth, through the station’s brick and concrete ceiling, and into the track bed below. 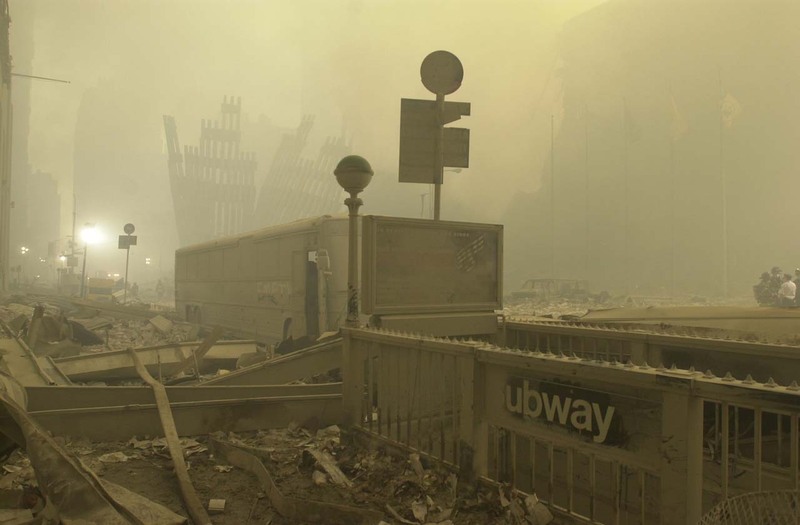 John Ferrelli, Chief of Infrastructure for Subways at the time, described platform columns twisted “like a Pringles chip.” Smoke and dust filled the air. Astonishingly, despite the unprecedented scope of the damage, no lives were lost anywhere in the subway system that day. 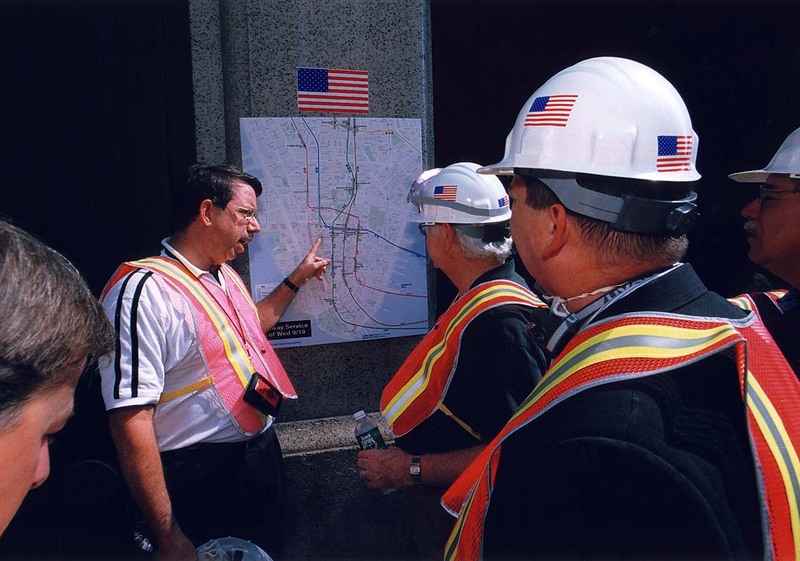 In the weeks following 9/11, thousands of MTA employees contributed to recovery operations at Ground Zero. 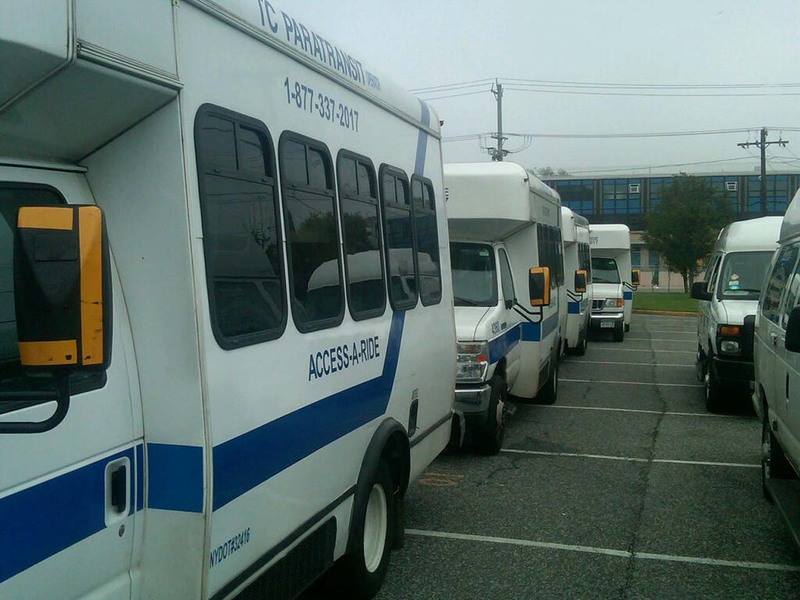 Many performed essential tasks as part of their transit responsibilities—operating heavy machinery, transporting equipment and personnel, rigging temporary communications and electrical networks. Others were volunteers who simply saw a need and came to help. Staff from every MTA agency formed “bucket brigades,” removing debris by hand alongside police, firefighters, and medical personnel. 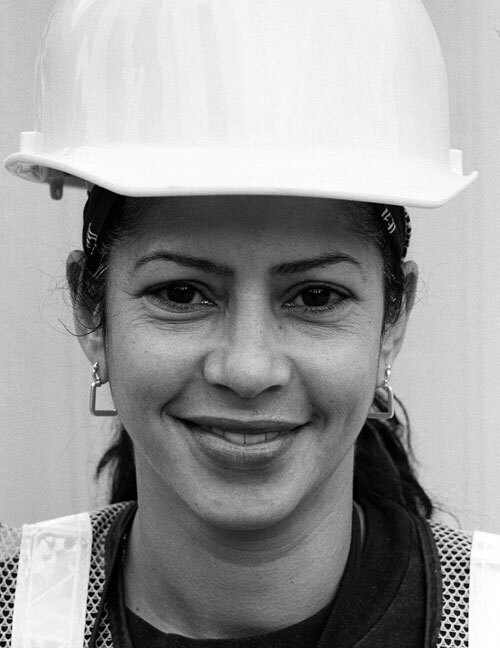 Operating and maintaining the city’s massive transportation system requires a large and diverse team of skilled professionals, from electricians and drivers to communications experts, engineers, and more. Their expertise proved invaluable. 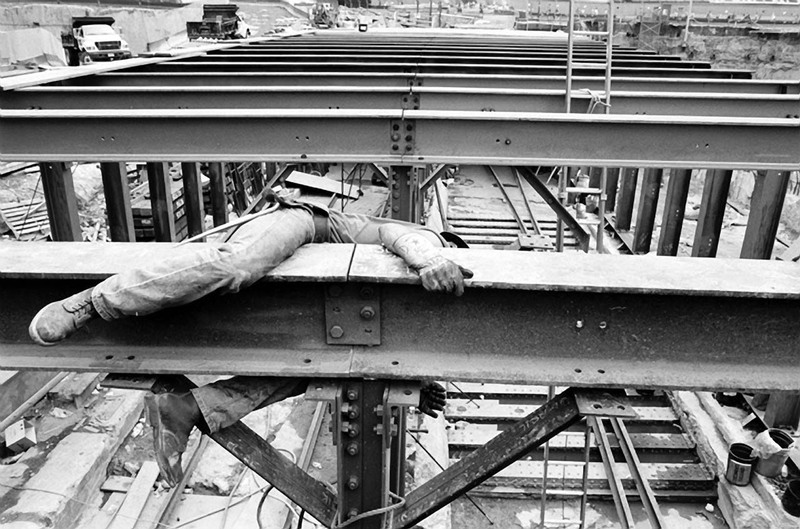 Within hours of the buildings’ collapse, New York City Transit ironworkers were on site, cutting through twisted steel to help search for survivors. MTA construction and repair crews brought a five-block-long convoy of heavy equipment to move concrete and fallen beams. 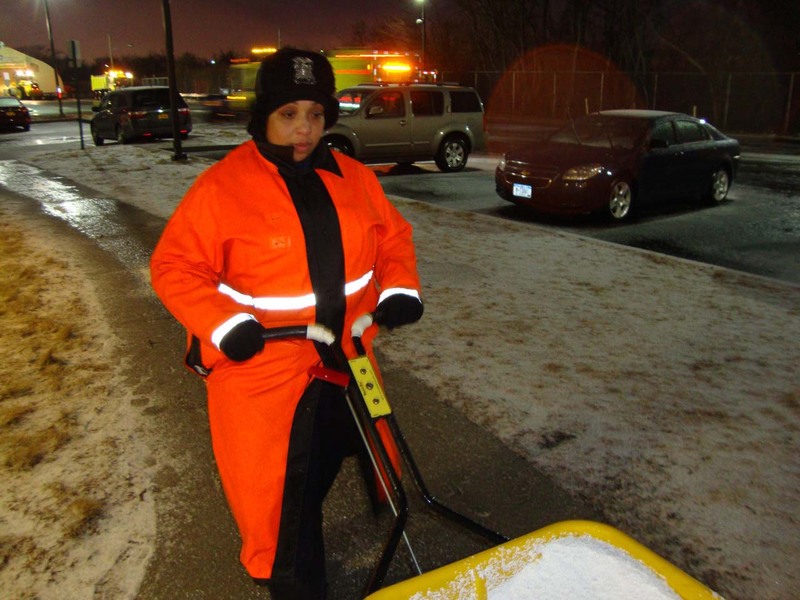 Transit workers arrived with helmets, safety vests, gloves, trucks, cranes, and other vital supplies. A transit system is, at heart, about moving people and goods from one place to another. In the days and weeks after the attack, that core job was tremendously difficult—and tremendously important. 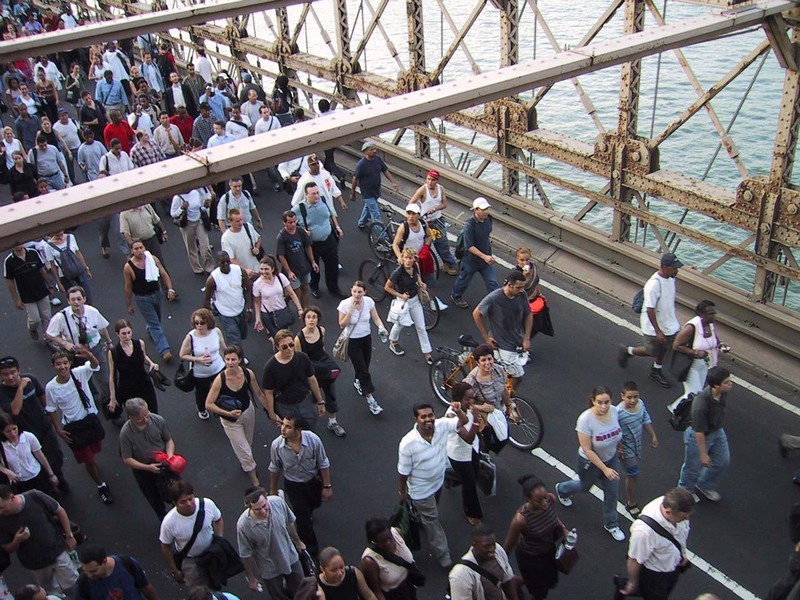 Subways were bypassing Lower Manhattan, and streets were blocked. Yet emergency workers and essential supplies had to reach Ground Zero. With key infrastructure disabled near Ground Zero, and thousands of first responders in desperate need of communications, power, and other basic resources, the MTA stepped in. 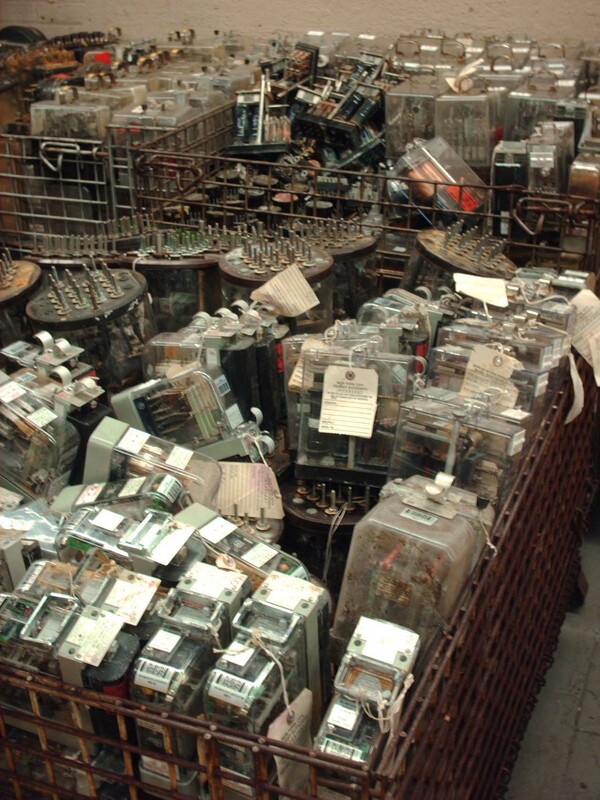 Past experience had taught MTA planners the importance of redundant systems and backup equipment. 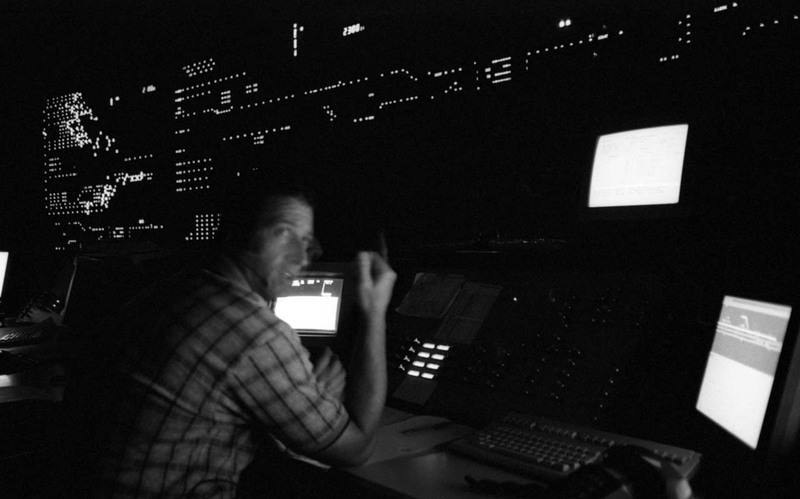 So, with electricity out in Lower Manhattan, NYC Transit brought its emergency generators to run traffic signals, lighting, and computers. It provided power for the Mayor's Office of Emergency Management and key command centers. Telephone and cell phone service were also crippled or overloaded. But the transit system had several functioning communications networks—the only communications systems independent of Verizon—which provided critical phone service to police headquarters. Subway service changed 40 times in the first three days after September 11, with bus routes adjusted accordingly to support those changes. To keep New Yorkers informed (in an era before smartphones), the MTA printed and distributed updated paper maps daily. 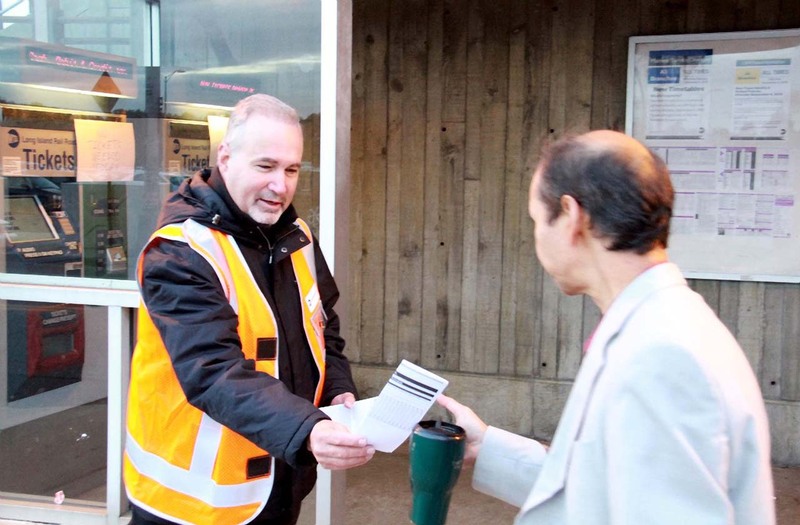 Transit staff even walked the streets with bullhorns and flyers to provide information. 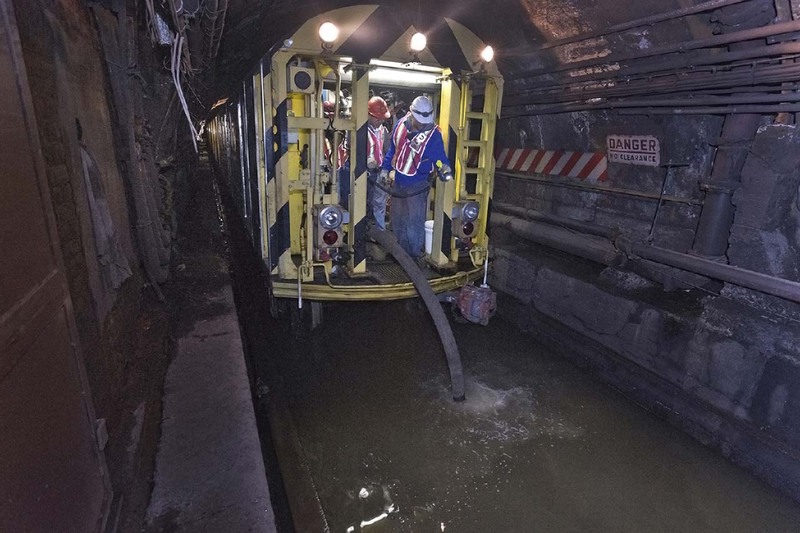 The next weeks and months saw a long process of recovery as MTA crews began rebuilding crushed tunnels and repairing systems to restore full subway service in Lower Manhattan. 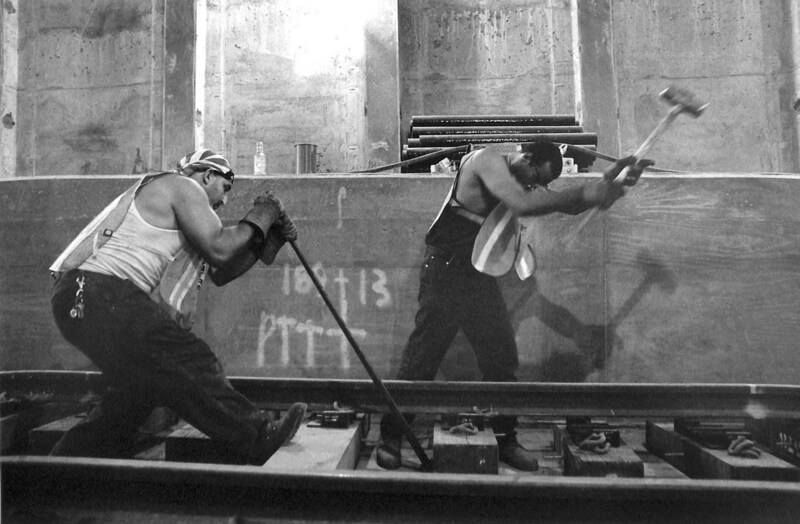 To serve the people who live, work, and go to school in Lower Manhattan—and to help re-establish a sense of normalcy in the city—it was essential to restore the 1/9 train line quickly. 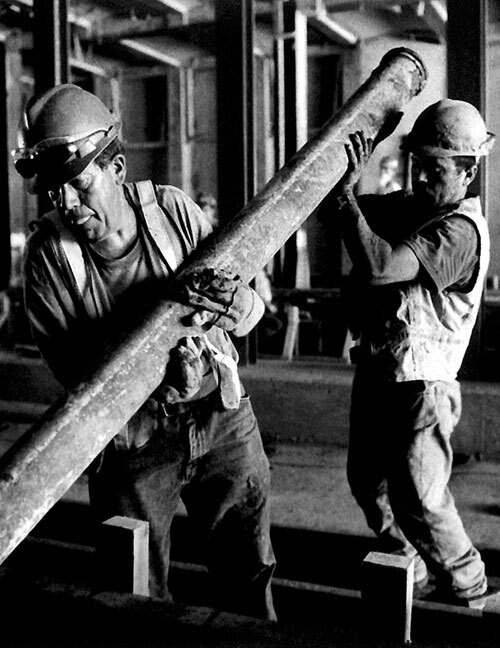 Working around the clock, crews installed new track, utilities, ventilation systems, signals, and other equipment—a complex ballet of contractors, designers, and managers. Reconstruction was completed ahead of schedule, and 1/9 subway service resumed by mid-September 2002—just one year after the attacks. Bus No. 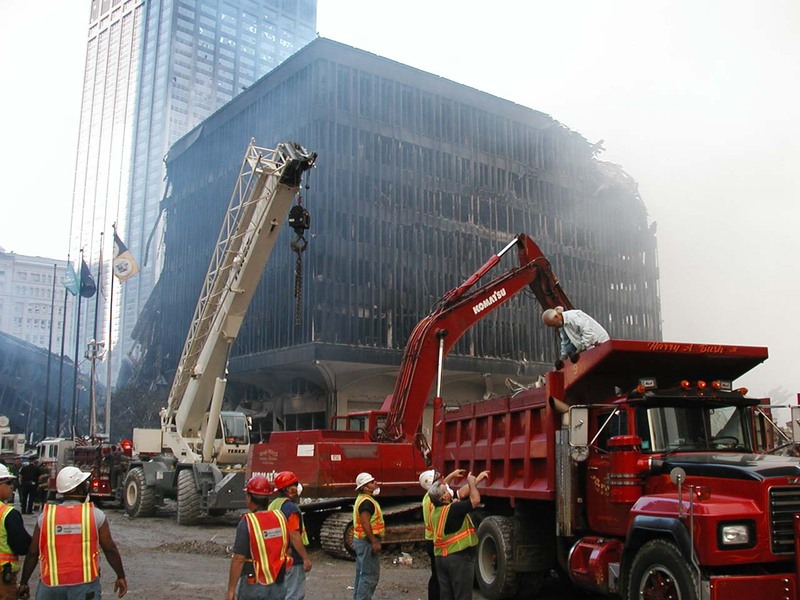 2185 sat covered in dust, ash, and debris on September 11, 2001. It was badly damaged and ready to be scrapped. 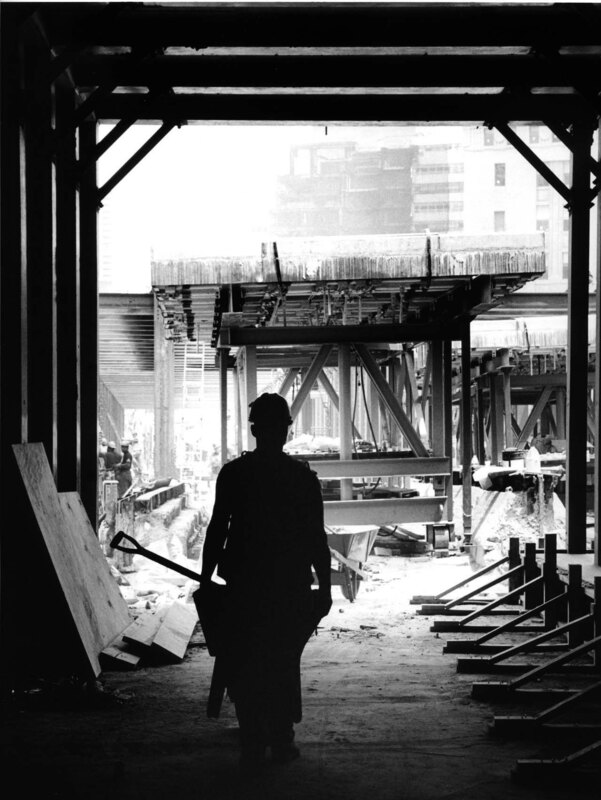 But the MTA opted instead to restore it as a powerful symbol of the city’s determination to rebuild, and of the transit workers’ resolve and dedication. Temperatures in Ohio reached 88º on August 14, 2003. As people cranked up their air conditioners, the electrical demand caused a power line near Cleveland to overheat, expand, sag, touch overgrown trees…and shut down. The utility’s alarm failed to sound, and as other power lines picked up the load, some also overheated. Those events led to a cascade of power failures and triggered North America’s biggest ever blackout, affecting more than 50 million people. 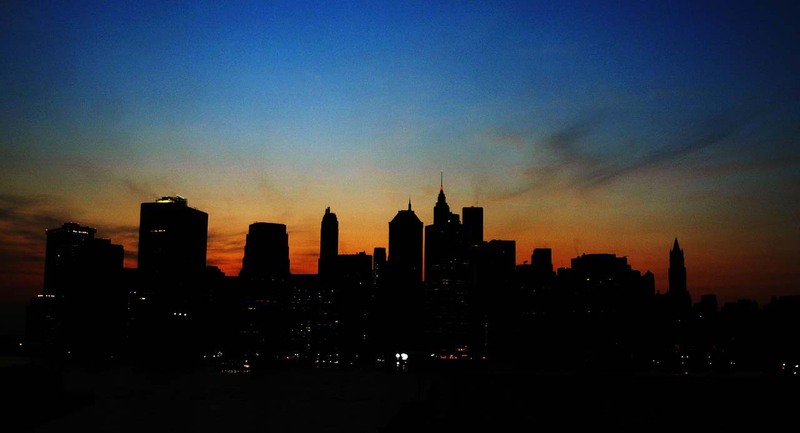 Power went out in New York at 4:10pm. Subways and commuter trains stopped. Traffic lights went dark. With no advance warning, the city was thrust into transit chaos. Imagine you’re riding the subway home after a long day at work. Suddenly, the train stops. The car goes dark, except for a few emergency lights. 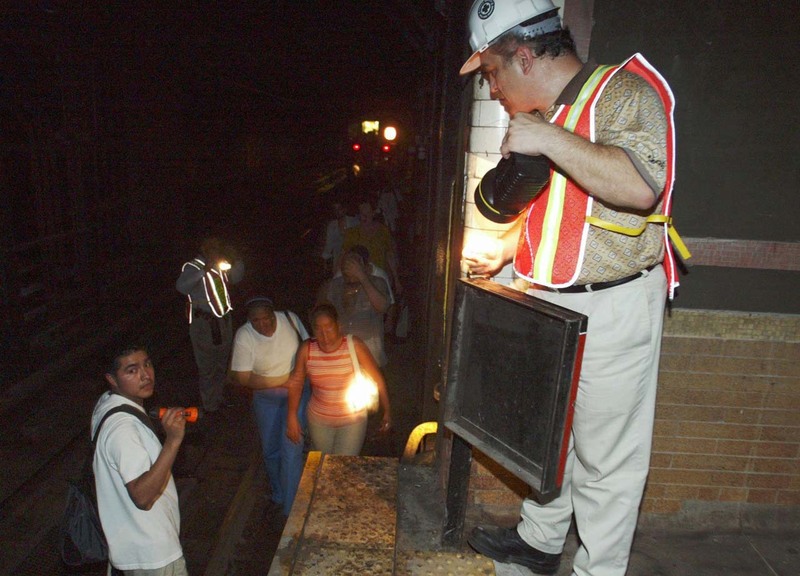 As the minutes tick by, you begin to suspect this isn’t your average subway power outage. 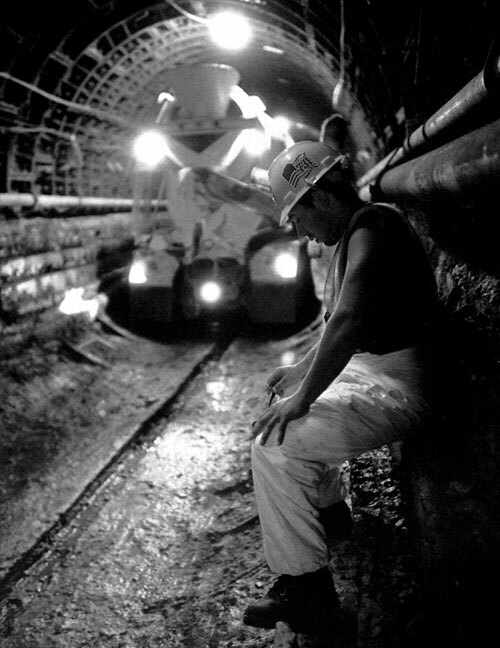 Out of nowhere, a transit employee in an orange vest appears—armed only with a hand-held flashlight—and calmly leads you through the dark, damp tunnels and into the dwindling light of a late summer afternoon. 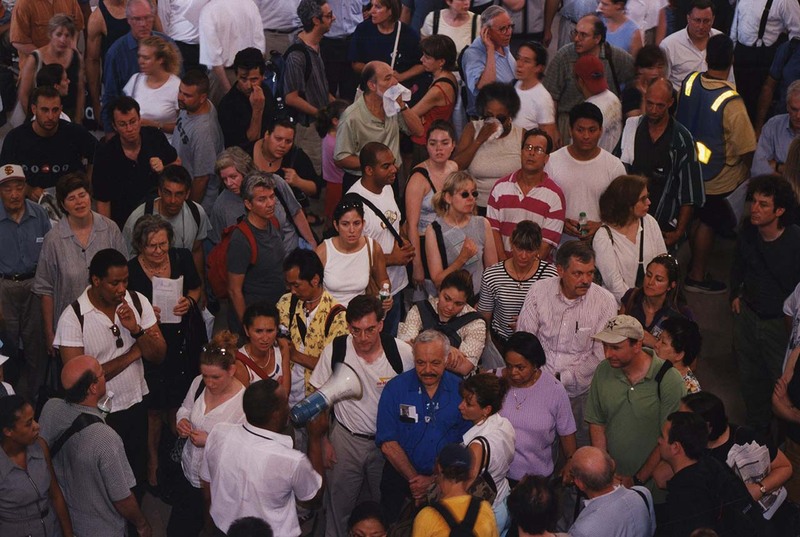 This was the experience of thousands of New Yorkers on August 14, 2003. As tunnels went black, stalled subways marooned more than 400,000 passengers, spread across 413 far-flung trains. Crews began evacuating riders within 10 minutes. New York City Transit shut down power systems so that the third rail would safely stay off if electricity suddenly returned. With the simple tools at their disposal—battery-powered radios and handheld flashlights—workers led passengers to safety. The crisis had come out of the blue, but training and experience paid off. Agency employees rescued nearly half a million riders in under three hours, with just three minor injuries. 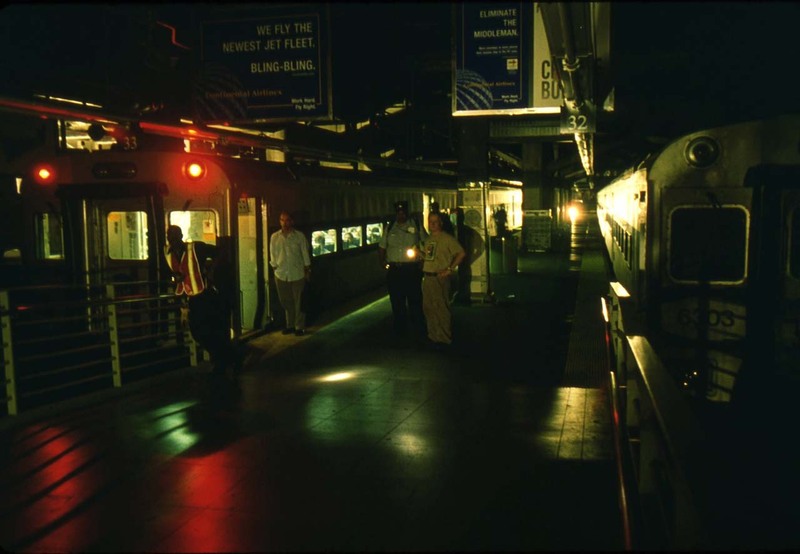 When the blackout struck, the MTA’s most urgent task was to locate stopped trains and coordinate rescue operations with conductors and emergency personnel—all of which depended on communications. 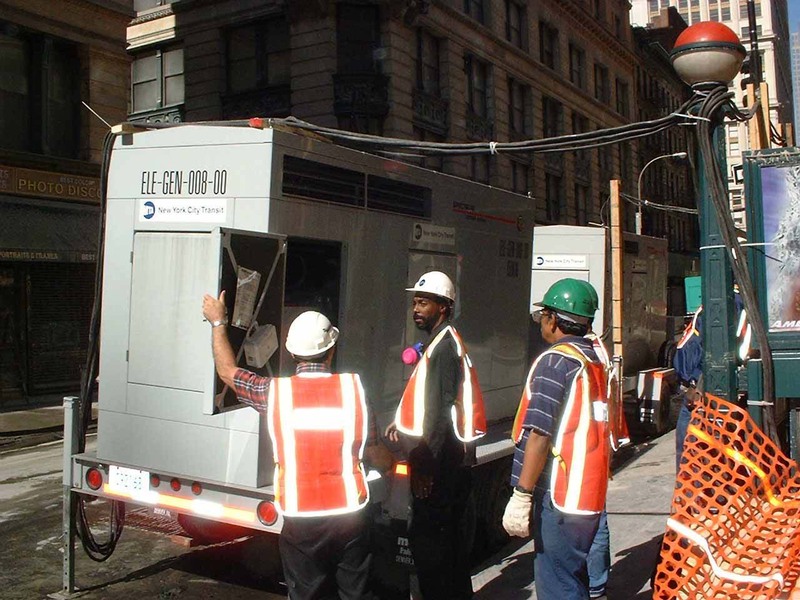 Ready for just such a situation, New York City Transit immediately deployed emergency generators to keep its critical fiber optic communications network running. Train crews, meanwhile, used two-way radios to communicate with each other and with central command. Once trains were located, MTA officials mobilized additional personnel to assist in evacuations. 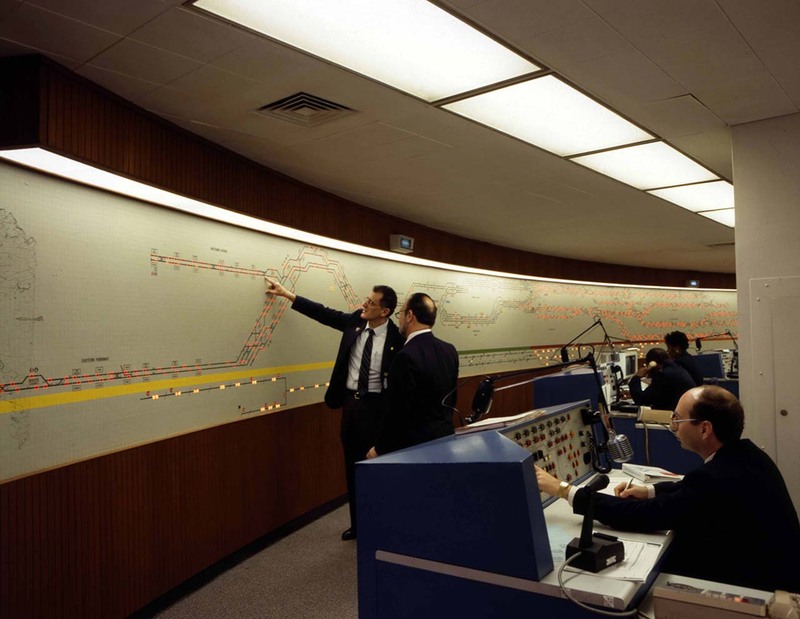 Thanks to these preparations, New York City Transit’s vital communications network continued running throughout the blackout. 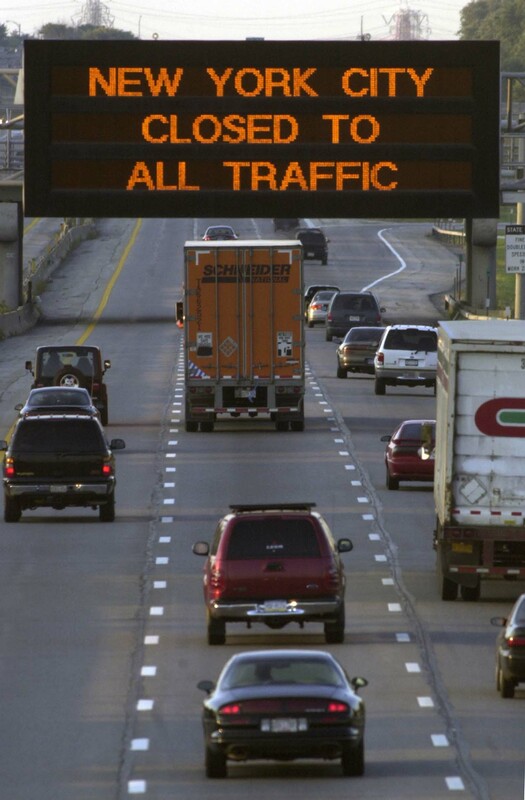 What do you call “rush hour” when nothing’s moving? Electric-powered railroads and subways stopped just as millions were heading home. Bus drivers tried to shoulder the transit burden, but traffic lights at New York City’s 11,600 intersections were dark and streets were clogged. 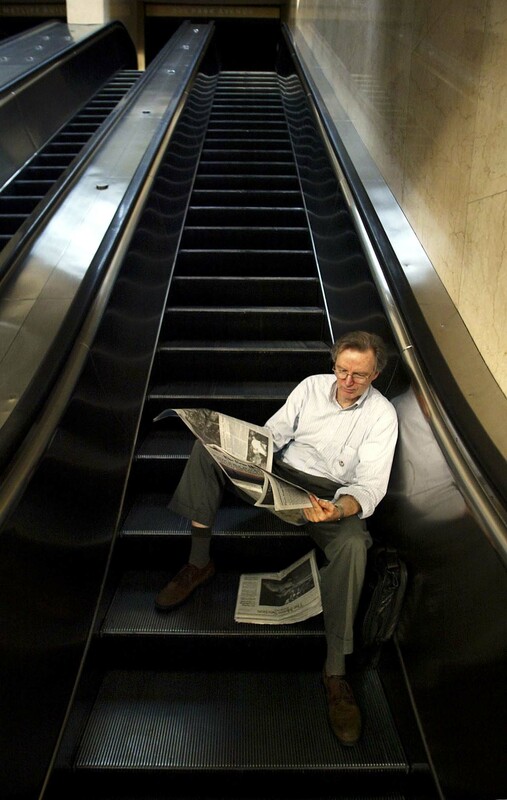 Stranded commuters filled Penn Station and Grand Central. Bridges and tunnels had emergency generators for lights and signals, but chaotic traffic blocked access. 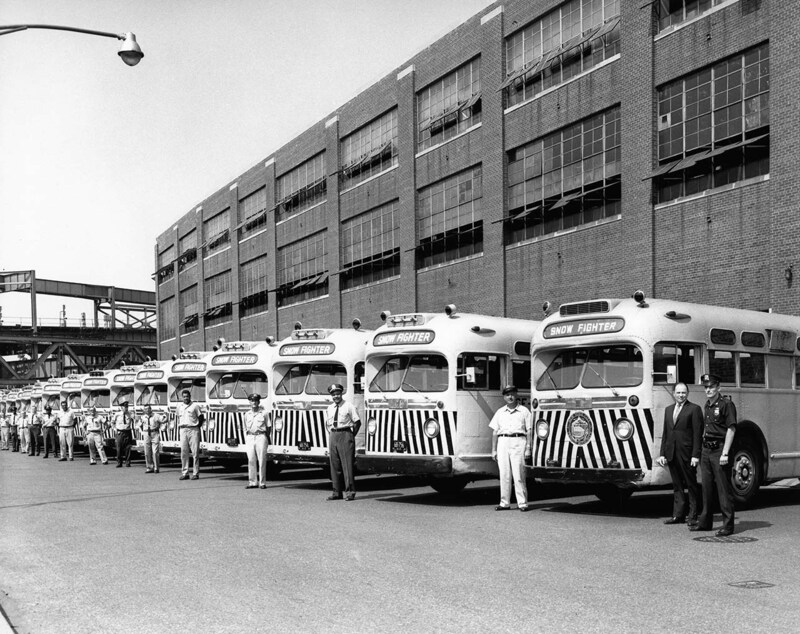 Nevertheless, buses successfully shuttled commuters to Long Island. 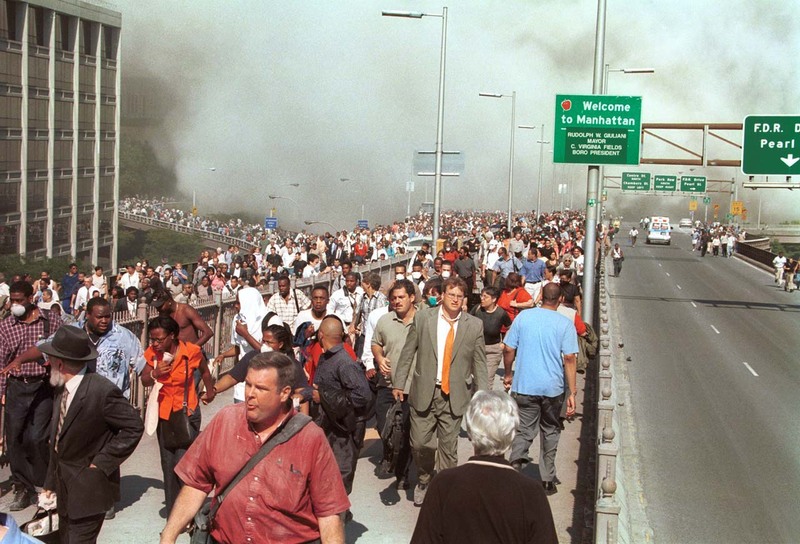 And pedestrians, helped by transit workers, streamed across city bridges, a scene reminiscent of September 11, but this time with jovial camaraderie—relief that the problem was technical, not terror. 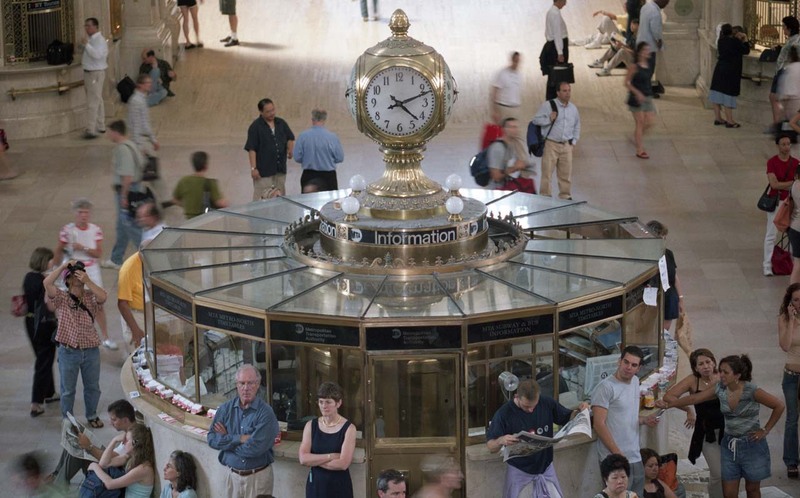 On an average day, three-quarters of a million people pass through Grand Central Terminal. 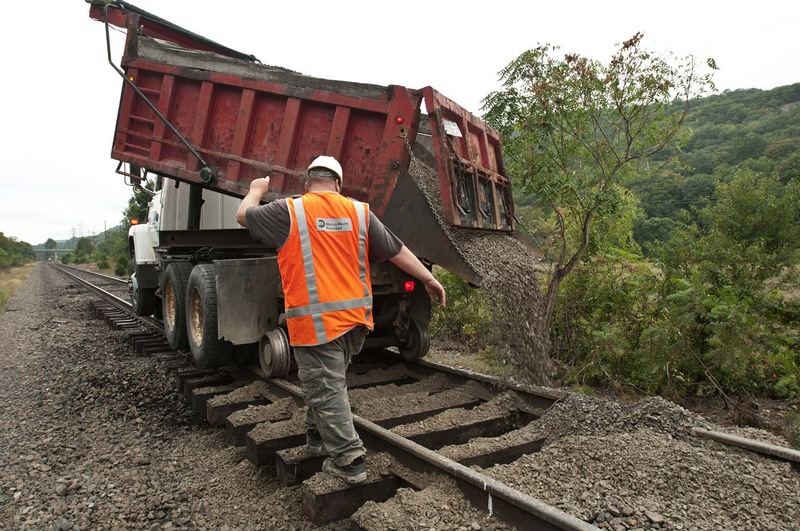 Thousands of commuters arrive each morning on Metro-North Railroad and continue on to their jobs in the city. Every evening, they return to Grand Central to catch the train home again. But on the evening of August 14, 2003, there were no trains to be caught. Instead, weary travelers stretched out on benches, huddled on the floor of the Main Concourse, or dozed off on the pavement outside—waiting for something or someone to show them the way home. 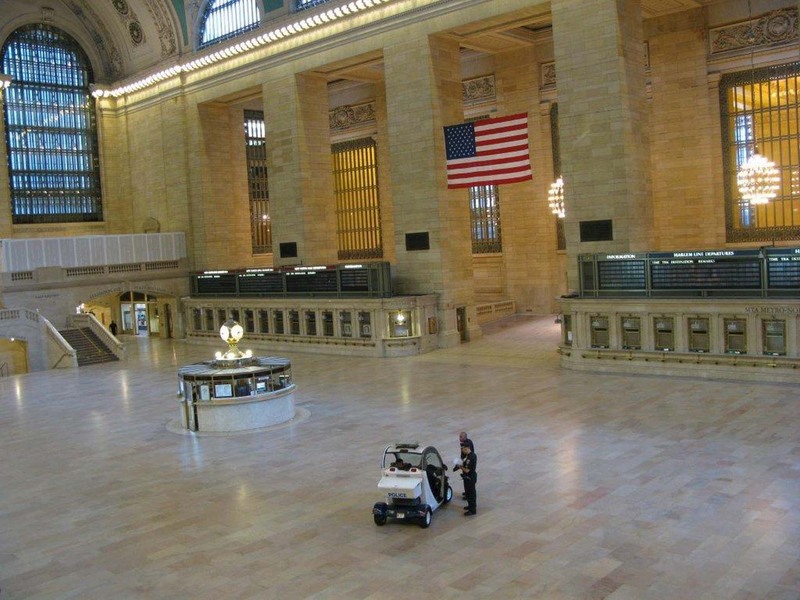 Grand Central is usually synonymous with hustle and bustle, but that day there was very little hustle to be found. “Off” is Fast. “On” is Not. 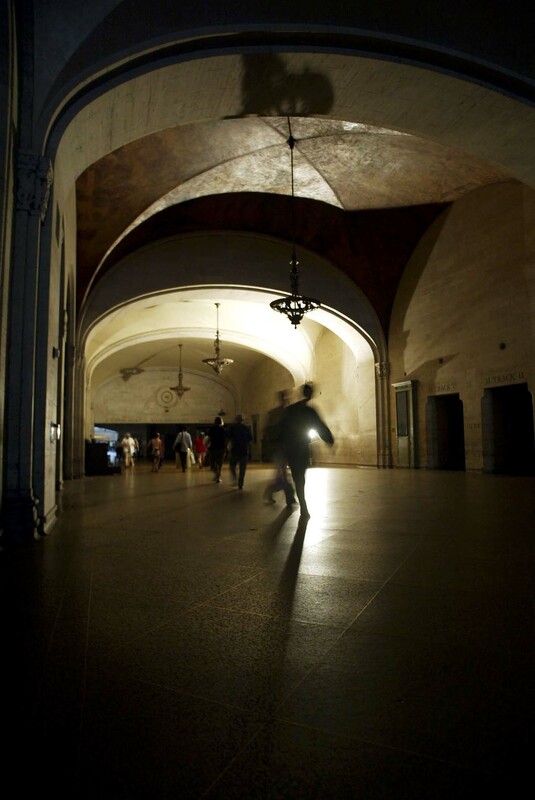 When the power stops, subways and railroads halt immediately. Yet when power returns, the system doesn’t instantly rebound. Signals, lights, track switches, and communications all depend on electricity. Before service can resume, crews must check every system. And transit workers—from engineers and drivers to operations managers and station staff—must reach their offices, depots, or trains…without a transit system to get them there. The blackout struck Thursday afternoon. Power was fully restored at 9:03pm Friday. Astonishingly, subways were rolling again by 6:00am Saturday. Some crises strike unexpectedly. Others—particularly weather-related threats—arrive with advance warning. And as forecasting technology improves, so does our ability to prepare. 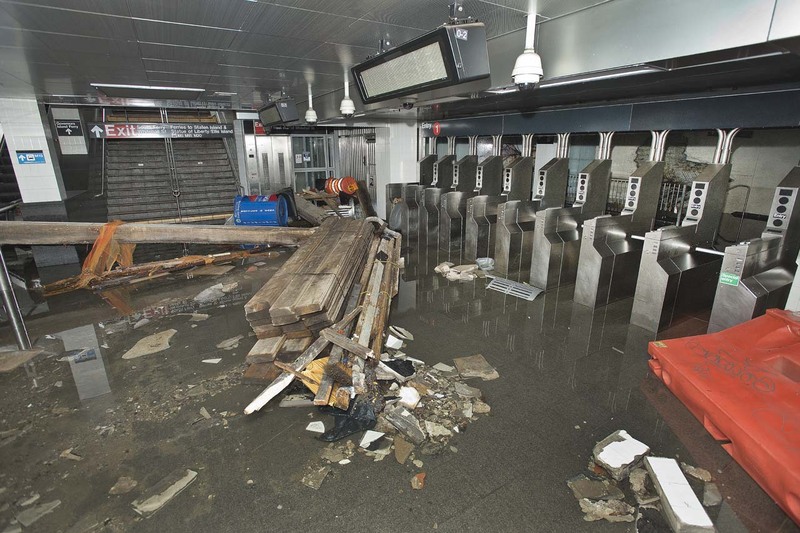 Although the precise timing and disruption may be hard to predict, simply knowing that something like 2011’s Hurricane Irene is coming lets the MTA take steps to protect infrastructure, organize rescue and repair crews, and alert the public. And each challenge provides valuable lessons in preparing for the next. 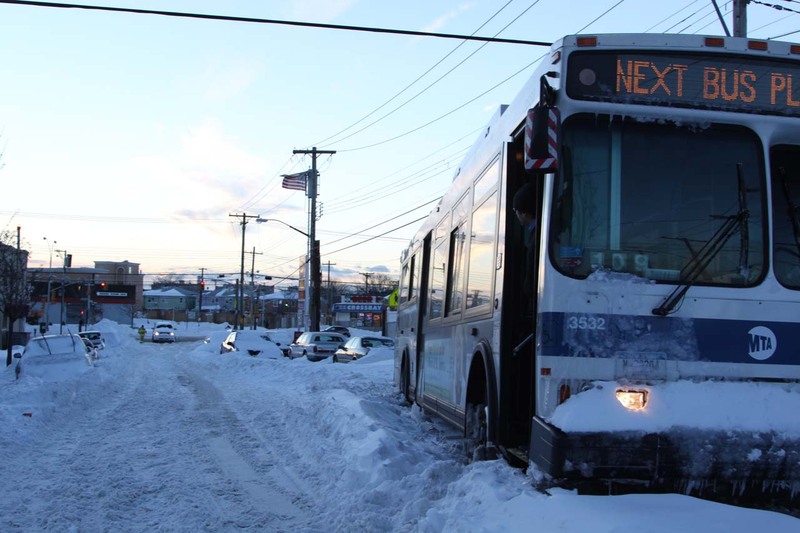 When forecasts suggest that a major storm is approaching, MTA officials activate detailed protocols for responding to the expected conditions—from hurricanes to blizzards to floods. On the walls of this office, National Weather Service SLOSH maps (Sea, Lake, and Overland Surges from Hurricanes) indicate potential areas of flooding from Category 1 or 2 storms. The MTA also prepares its own maps and reports that focus on vulnerable parts of its network. 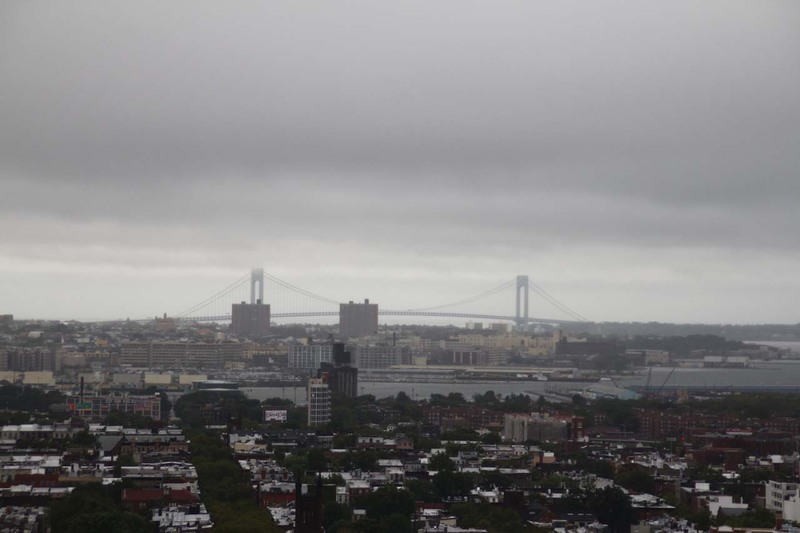 Before and during storms, staff monitors weather updates from many sources, and collects real-time data from weather sensors at MTA bridges and tunnels. 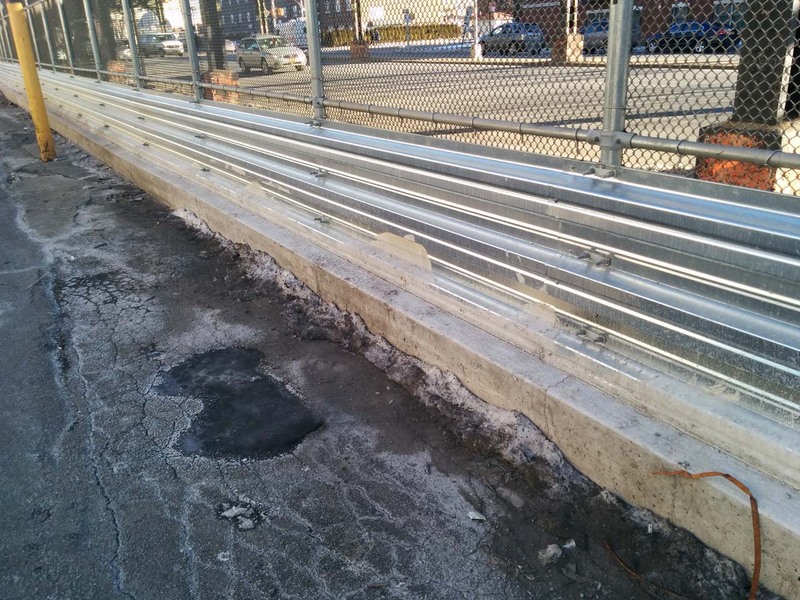 Transit planners have long experience dealing with harsh conditions. And they continually build on past experiences to hone procedures for hurricanes, blizzards, ice, and other challenging conditions. But preparing for severe weather doesn’t just mean planning what to do—it also means stockpiling the tools you’ll need to do it. 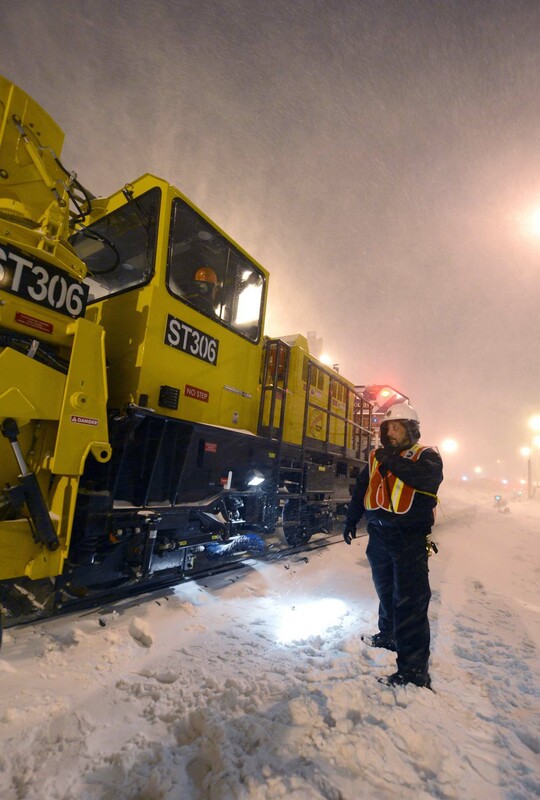 For winter weather, these include heavy-duty snow throwers, jet-powered snow blowers, and specially-built de-icing cars to clear rail yards, bridges, and tracks. 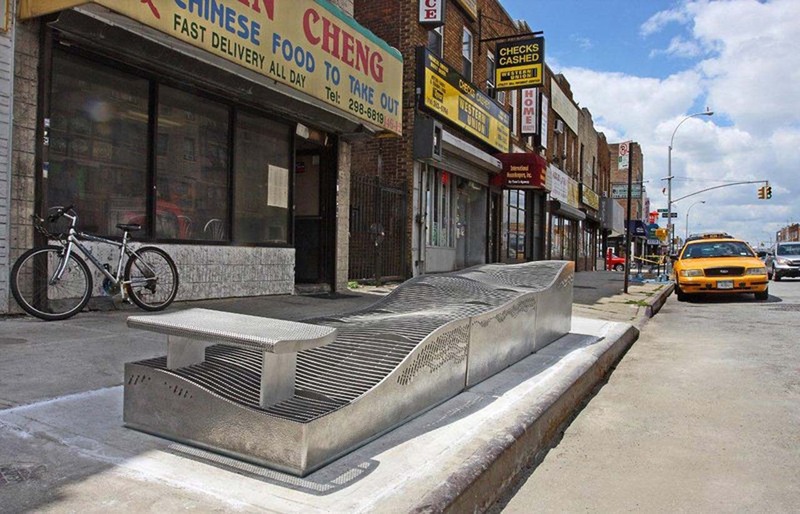 The MTA’s snow-fighting toolbox also includes old-fashioned equipment such as chains for bus tires, and shovels to clear steps at the city’s 468 subway stations. 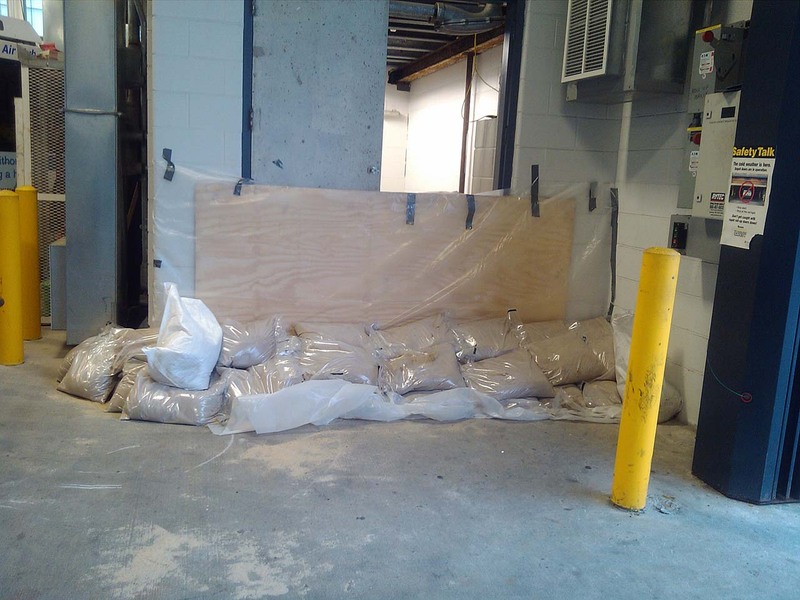 When floods threaten, plywood and sandbags have traditionally offered a measure of protection, while portable pumps help drain swamped tunnels and yards once the storm passes. Some New Yorkers probably dreamed of a white Christmas in 2010. What they got was a holiday nightmare. The snowstorm’s severity wasn’t recognized until December 25. The next day, the sixth most powerful blizzard ever recorded in the city dumped nearly 3 feet of snow in some areas, catching transportation systems largely unprepared. 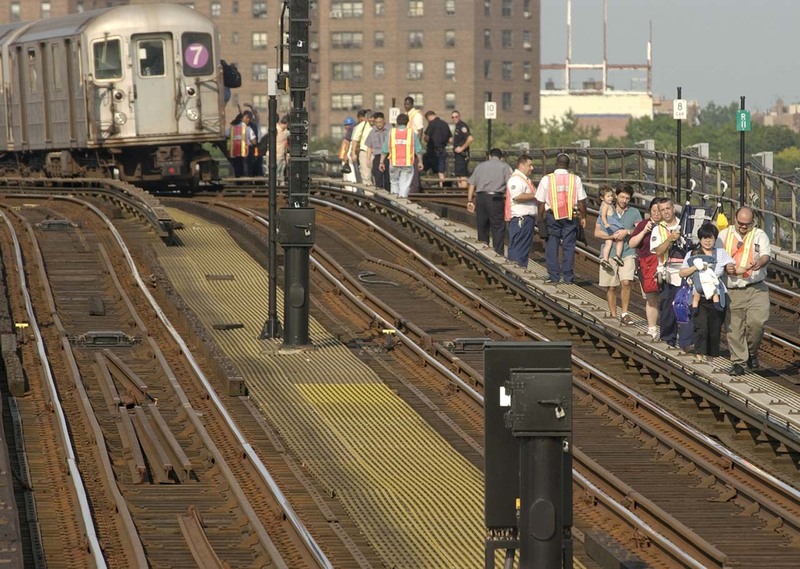 Subway passengers were stranded on elevated tracks. Commuter rails were at a standstill. 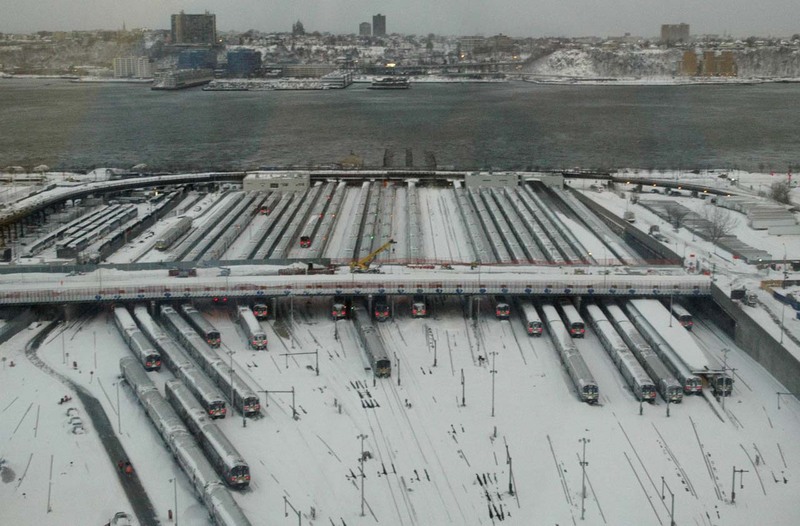 For two days, transit workers scrambled to recover, battling frozen tracks, buses stuck in drifts, and power outages. Service was restored within a few days. But shortcomings, including inadequate preparation, poor communications, and a failure to shut down systems in advance, provided valuable lessons for future emergencies—most notably that sometimes it’s wiser to suspend service proactively. "The City Ground to a Halt..."
Hurricane Irene was predicted to hit as a Category 3 storm the last weekend in August 2011. 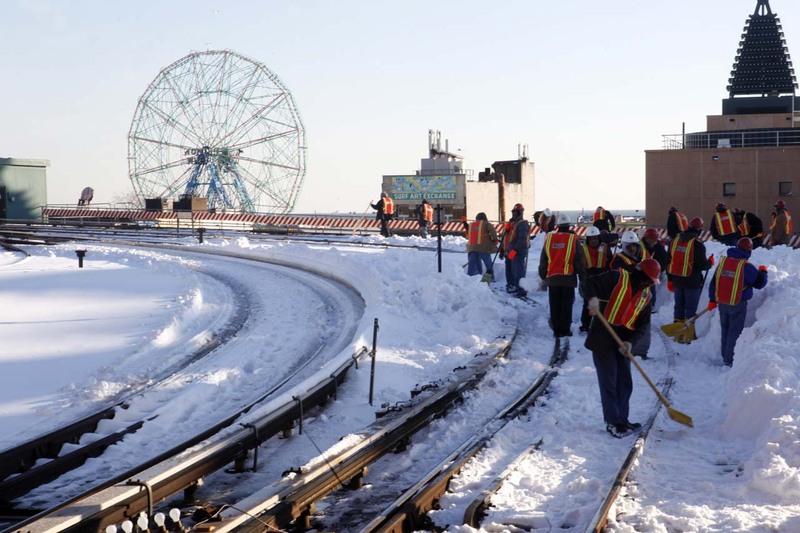 Guided by detailed hurricane plans—and having learned a valuable lesson about preparation from the 2010 blizzard—the MTA for the first time in its history suspended all of its services in advance. 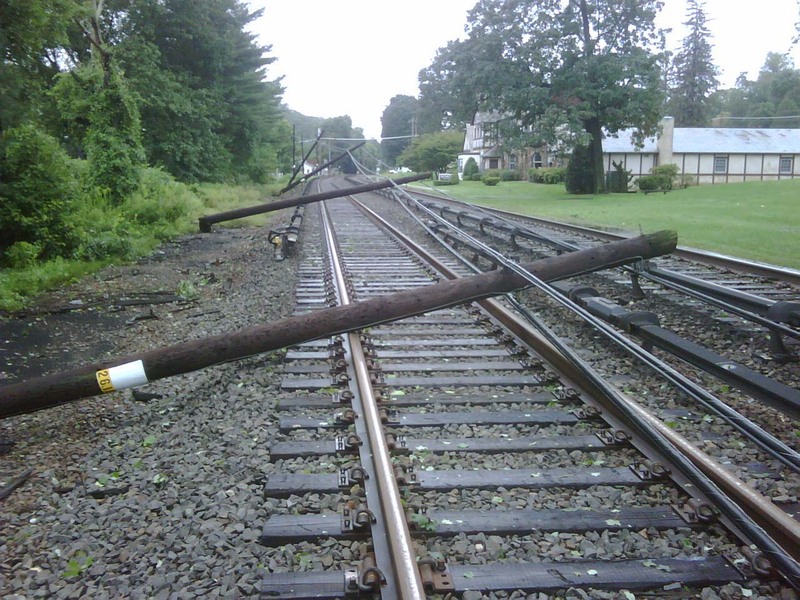 Though downgraded to a tropical storm when it finally arrived, Irene nonetheless toppled trees along Metro-North tracks, flooded transit yards, and triggered power failures. 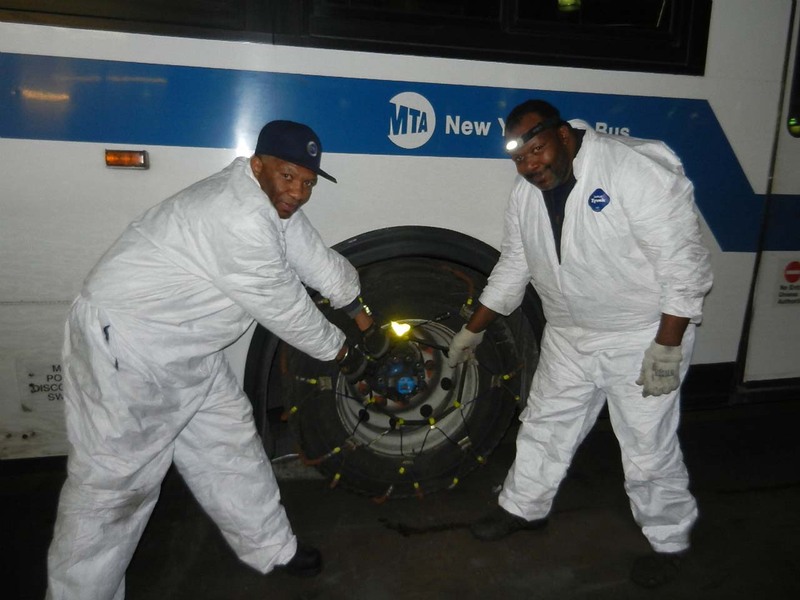 But preemptively shutting down service prevented greater damage and helped the MTA restore transit service faster. And for emergency planners, a storm that’s milder than expected is priceless preparation for one that isn’t. 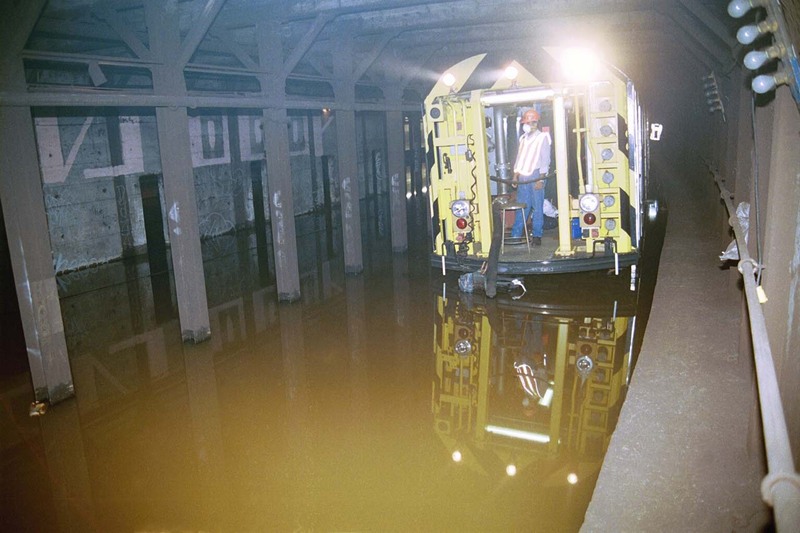 By shutting down service before Irene struck, the MTA sought to protect passengers and staff, ensuring that nobody would be trapped in tunnels or encounter washed-out tracks and roads. The shutdown also reduced the threat of equipment damage and let supervisors pre-position crews at key locations, so they could be ready to respond during and after the storm. Nonetheless, closing New York’s enormous transit system is a monumental task, requiring substantial time and effort. After helping take residents to emergency shelters, operators stowed buses and moved more than 1,000 train cars safely to high ground, ready for a quick re-start once the storm had passed. 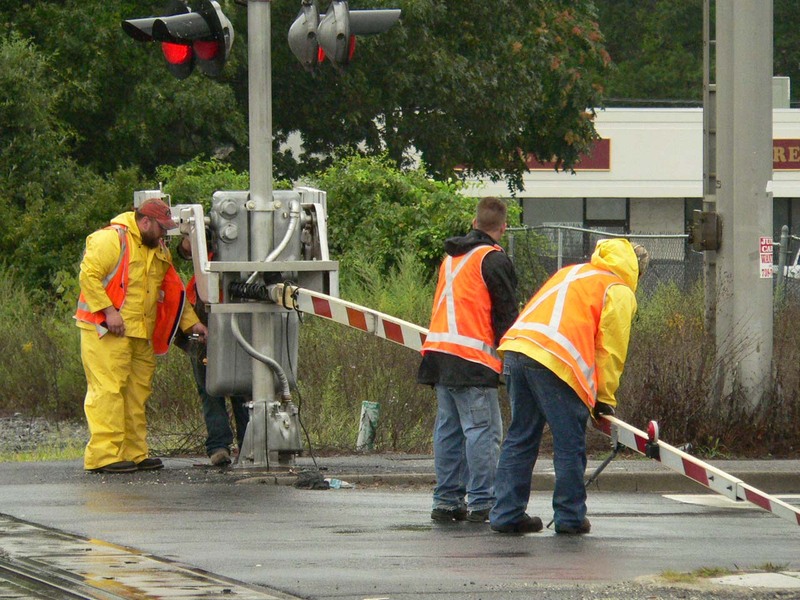 Crews removed vulnerable equipment from low-lying areas, and dismantled 295 railroad-crossing gates on Long Island to prevent wind damage. Hurricane Irene wasn’t as powerful as feared. 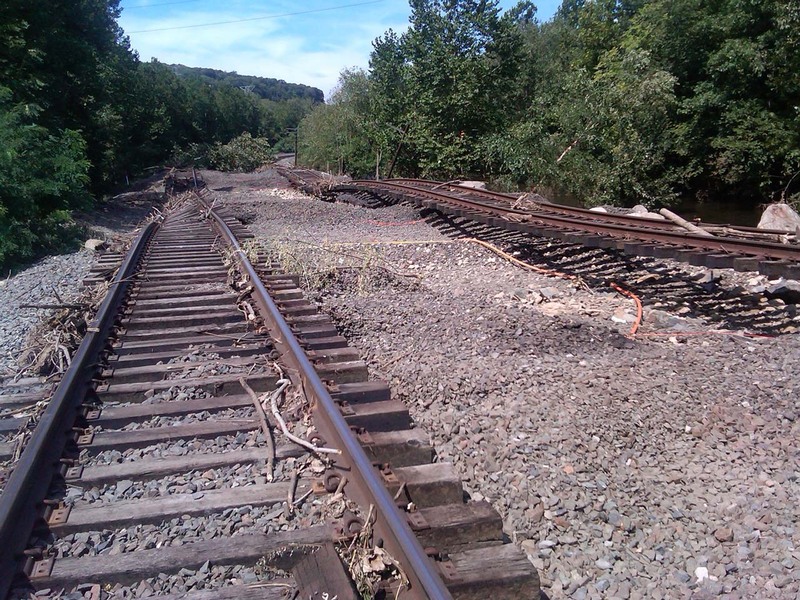 But damage was nonetheless widespread, with Metro-North particularly hard hit. 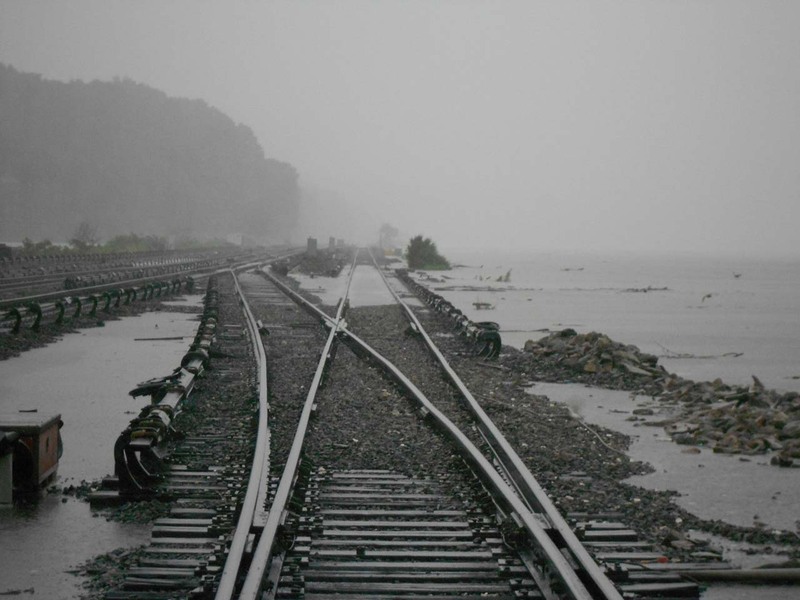 There was flooding along Metro-North’s Port Jervis and Harlem Lines, and landslides on the Hudson Line. 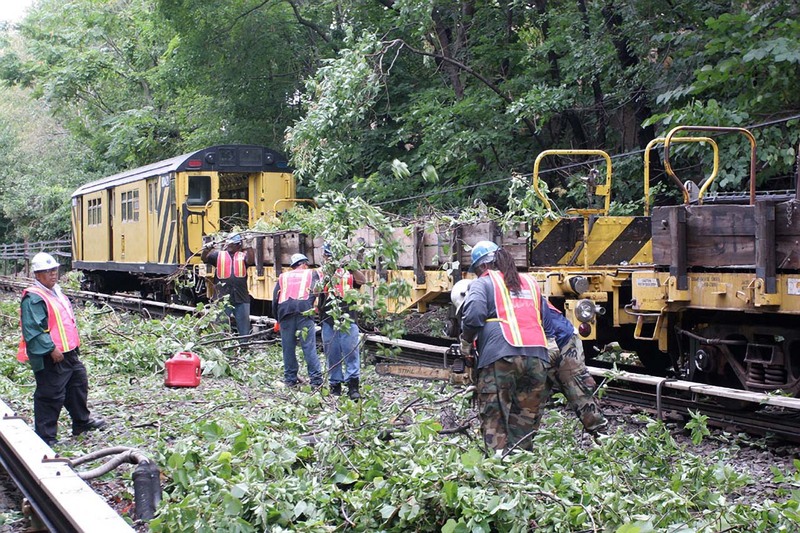 Downed trees dotted the entire rail network. 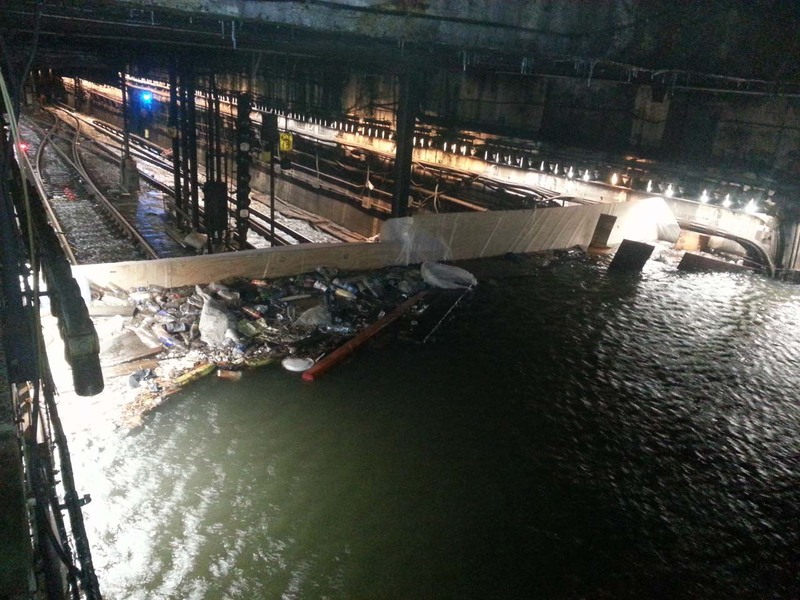 Flooding inundated low-lying train yards and the 149th Street subway tunnel. As soon as skies cleared, crews began surveying the impact across the transit system and fixing the damage—pumping water from tunnels, removing fallen trees, and reinstalling equipment that had been taken to safety. Crews walked every inch of track to make certain it was safe. 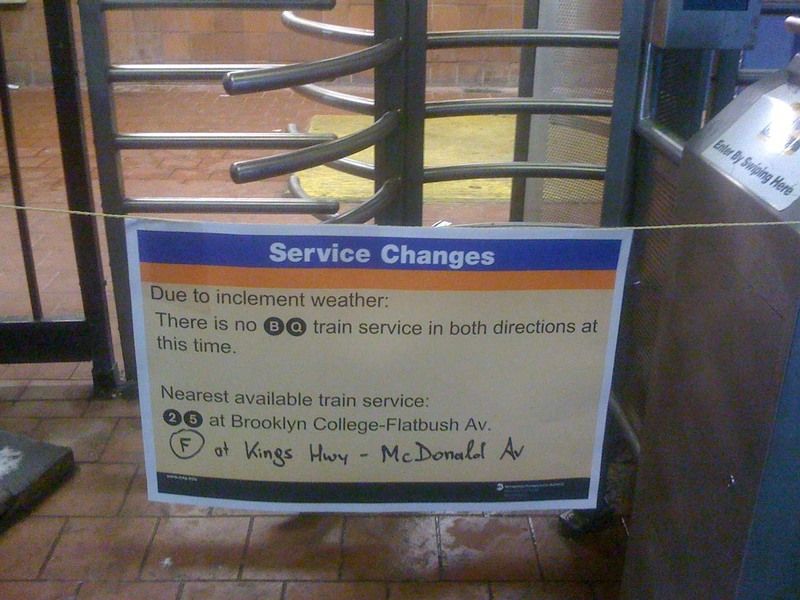 By Monday, a day after Irene, buses and subways were running. Metro-North and LIRR trains began rolling two days later. 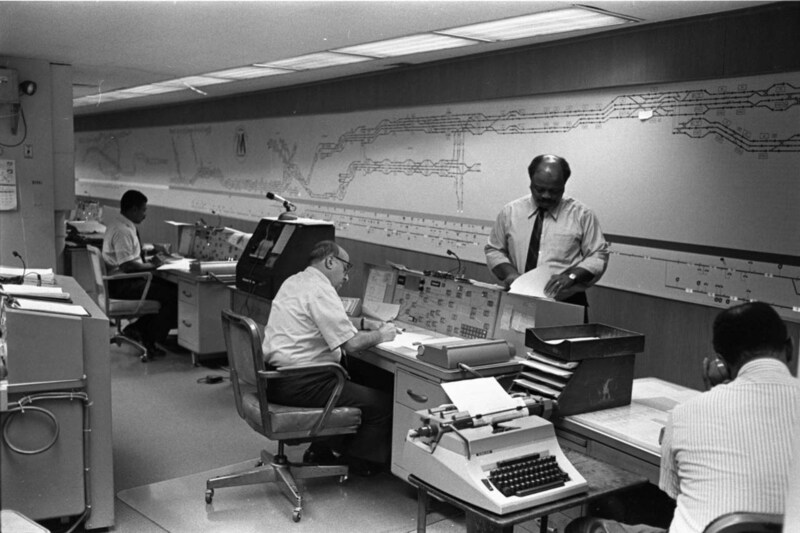 The decision to shut down the system in advance was a key factor in the rapid restoration of service. 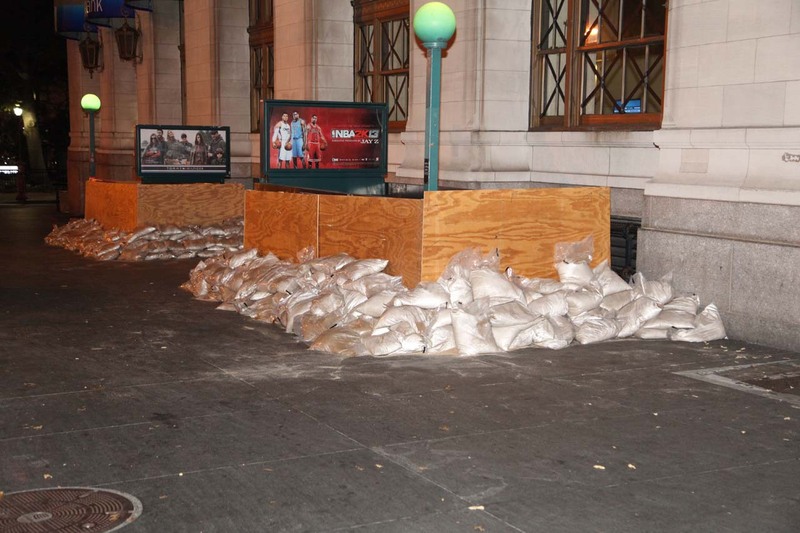 New Yorkers had never seen anything like Sandy. The October 2012 hurricane well earned its nickname “superstorm,” testing riders, transit workers, and infrastructure in unprecedented ways. 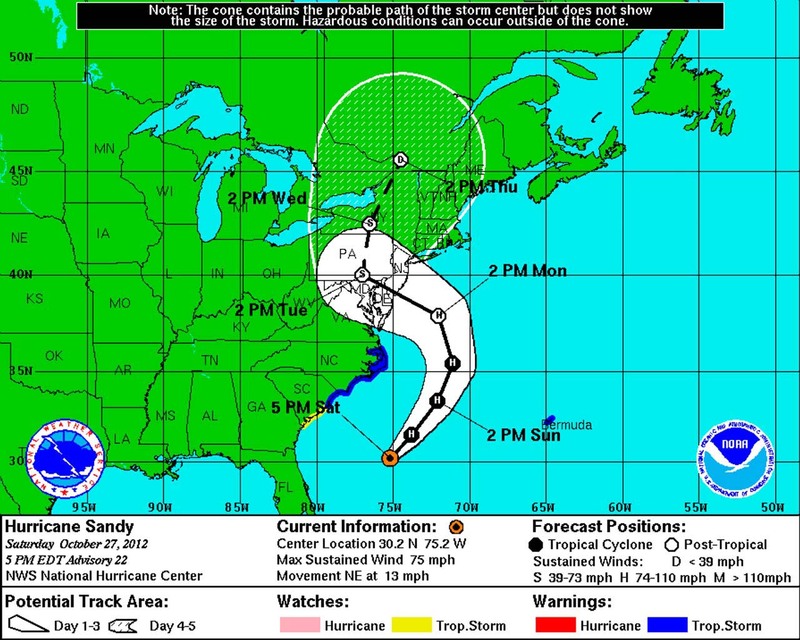 Lessons learned from previous disasters, including Hurricane Irene just a year earlier, helped staff prepare for Sandy. 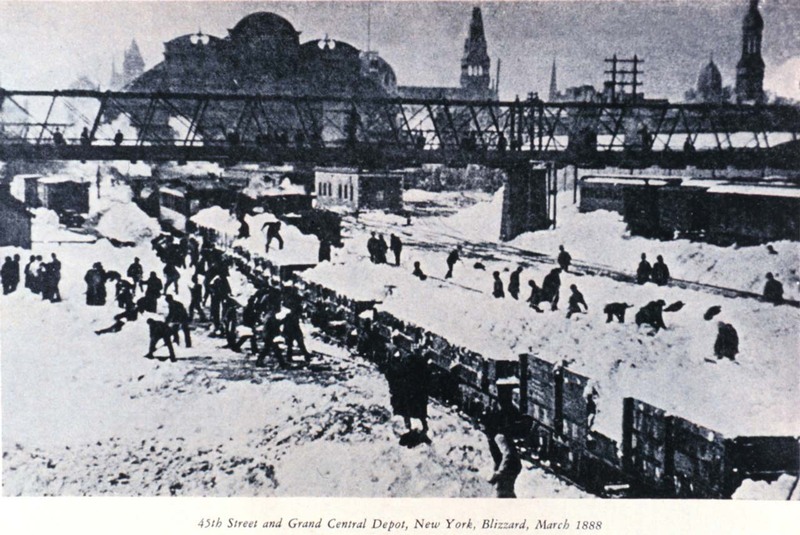 And transit workers’ ingenuity and resourcefulness brought the system back far more quickly than many had predicted, considering the scope of the damage. 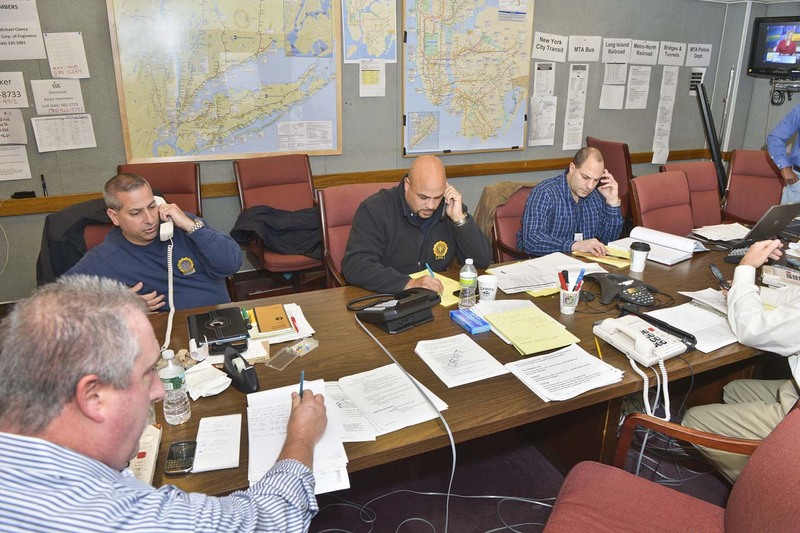 As Sandy battered the region, most residents retreated indoors—which was wise. 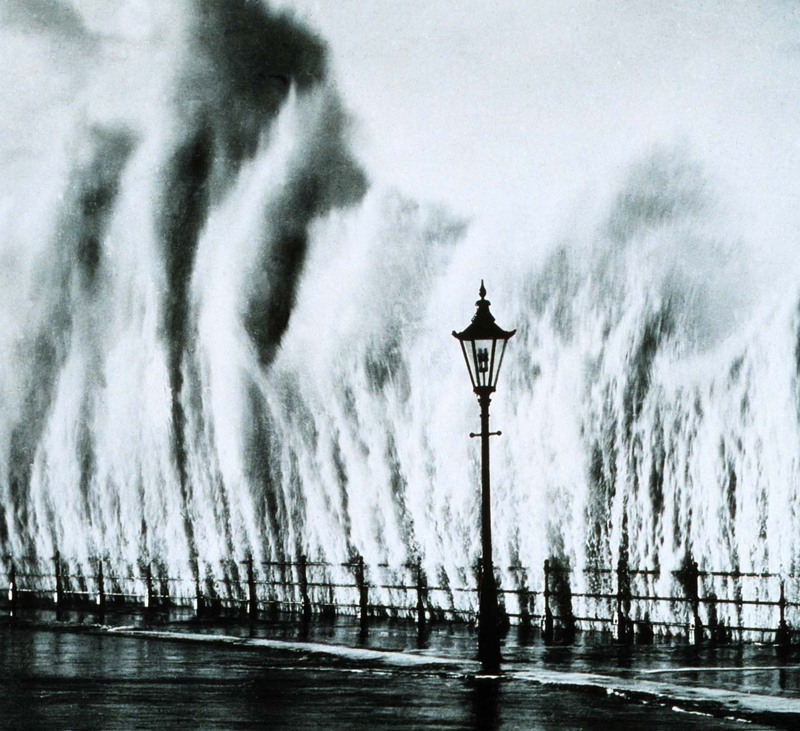 But it meant that people, safe in their homes and apartments, couldn’t see the damage being inflicted: the flooded tunnels, tree-strewn tracks, and depots swept by waves and wind. They could, however, follow it all online. 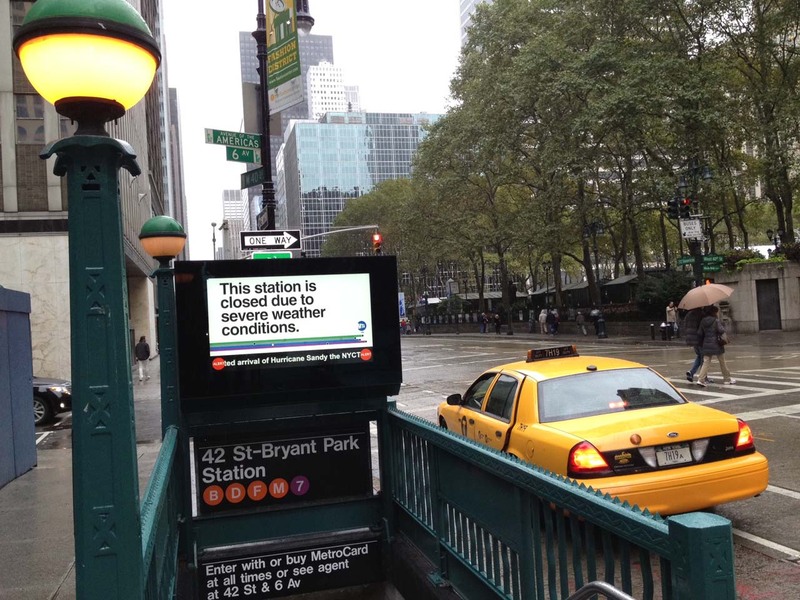 The MTA, recognizing the importance of conveying the storm’s scope and impact, continually shared photos and video on its website and through social media as events were unfolding. 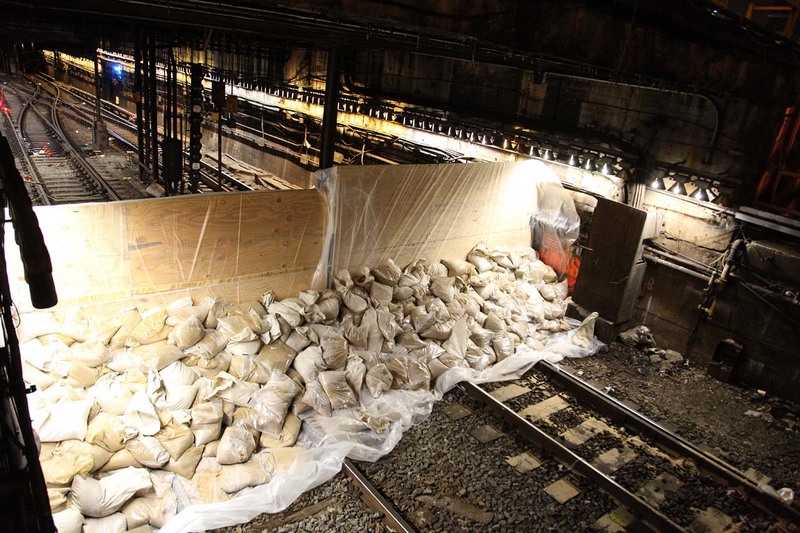 Applying lessons learned from Irene, MTA officials closed the subways, commuter rail systems, tunnels, and bridges in advance of Sandy—ensuring that passengers wouldn’t be stranded when the superstorm hit—and moved equipment to high ground. Crews covered station entrances and ventilation grates to minimize flooding, secured grade crossings, and erected temporary flood barriers throughout the system. Supervisors stocked provisions for workers who would stay at their posts around the clock during the shutdown and cleanup. 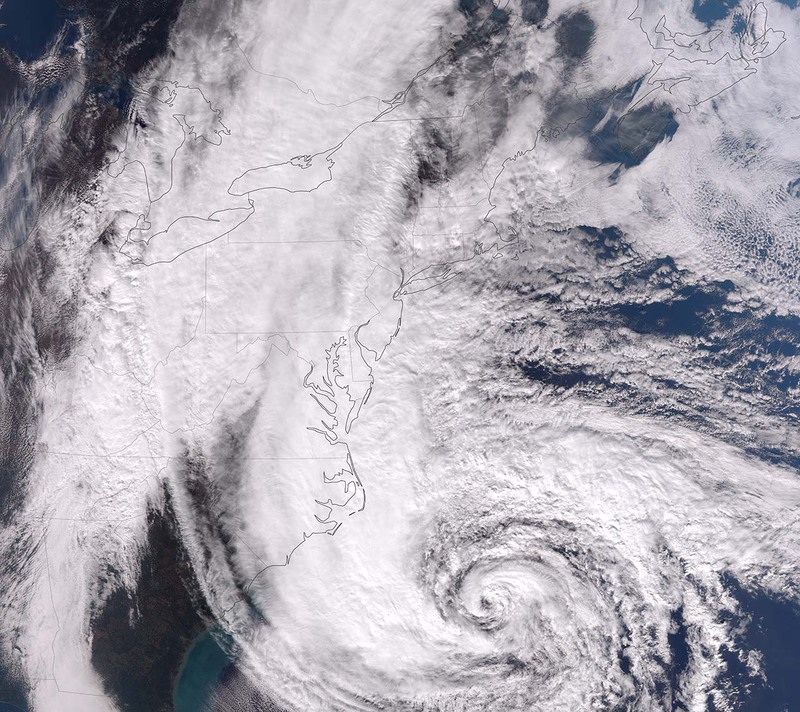 As Hurricane Sandy moved up the coast, a low-pressure system in the upper atmosphere swelled Sandy into the largest Atlantic hurricane ever recorded. 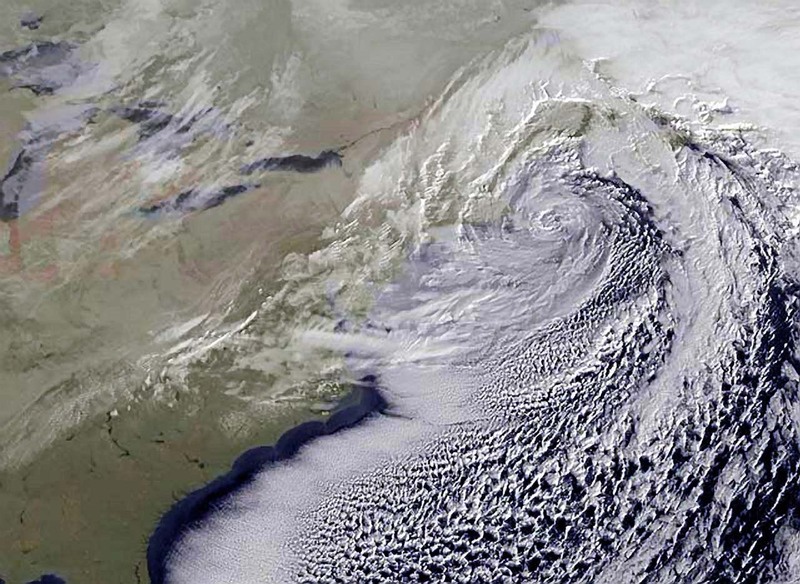 Other weather systems then forced it into an unusual left turn—straight toward New Jersey. The year before, Irene had been labeled a rare “100-year storm.” Now, just 14 months later, came an even bigger one. 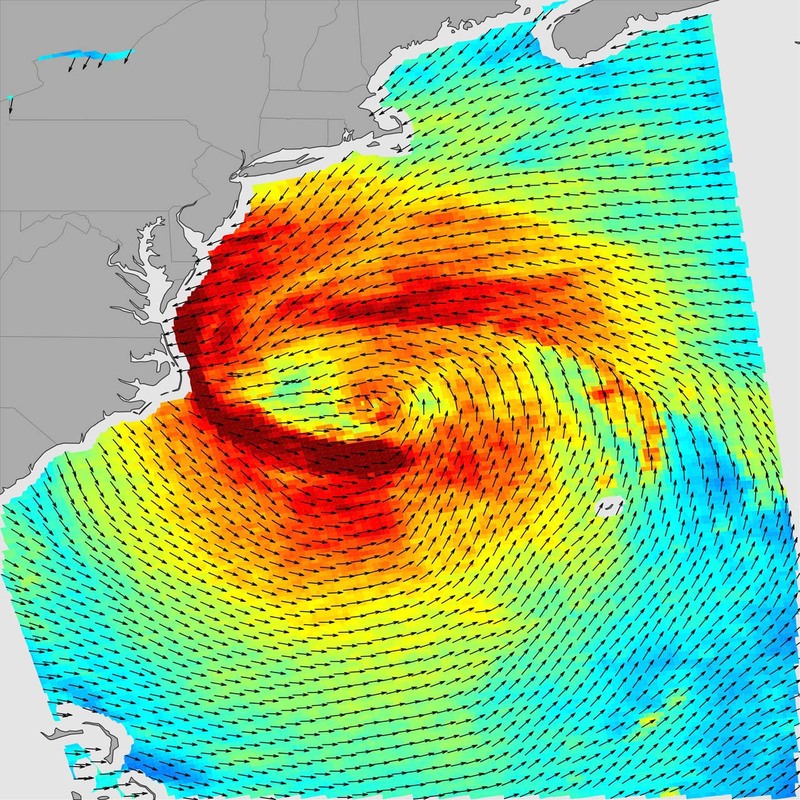 The intensity and direction of Sandy’s winds created a record storm surge, a swell of ocean water atop the high tide. Waves hurtled toward the densely populated metropolitan area, threatening to flood tunnels and wash away rails, roads, and power lines. Preparation can minimize problems. But when Mother Nature unleashes her full fury, preparation takes you only so far. 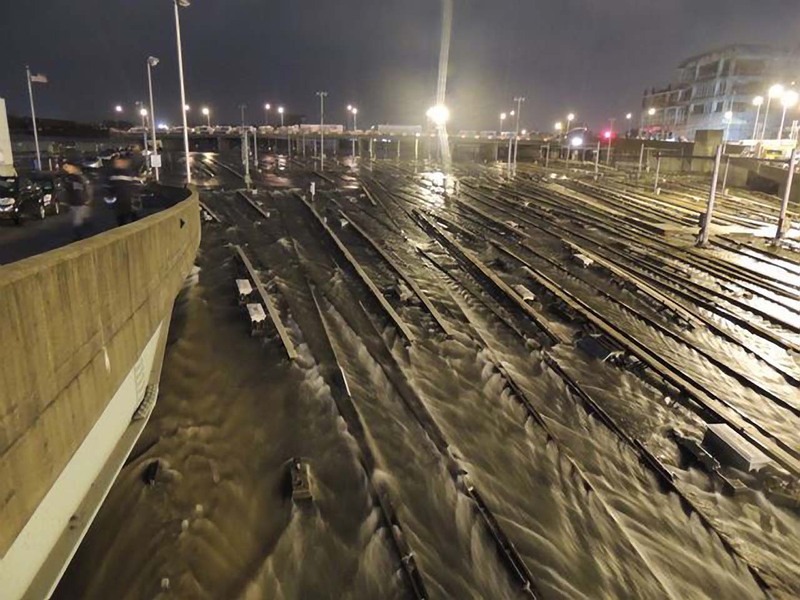 Superstorm Sandy overwhelmed shorelines, flooding a staggering 17% of New York City. 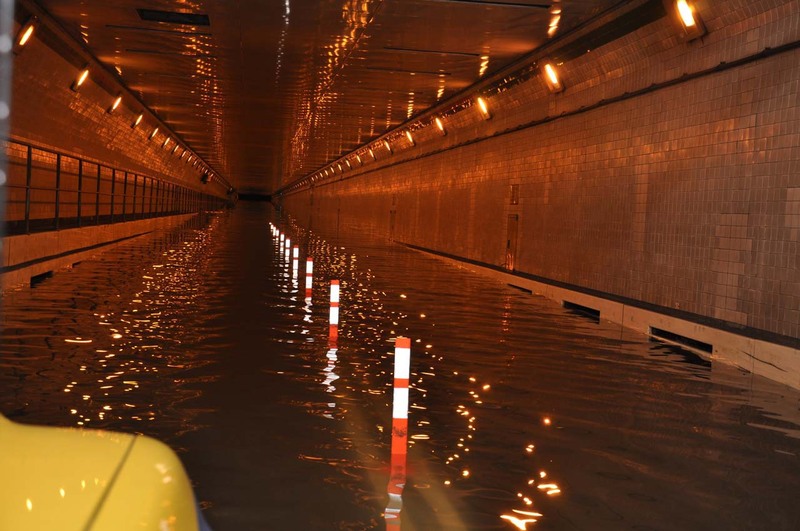 Seven subway tunnels connecting Manhattan to Brooklyn and Queens were flooded, along with the Hugh L. Carey (formerly Brooklyn-Battery) Tunnel and others. Power outages halted emergency pumps. 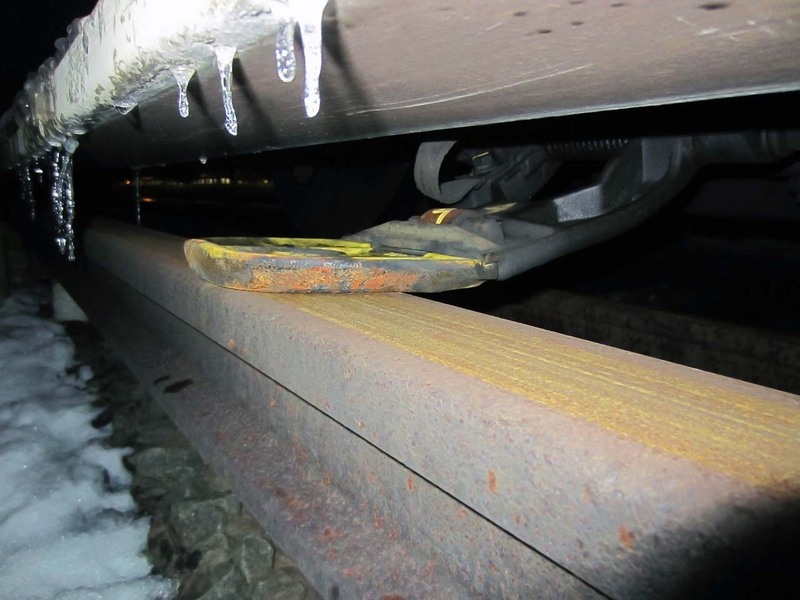 Downed trees blocked rail lines, and salt water damaged sensitive mechanical and electronic systems above and below ground. Salt water and electrical equipment are a bad combination. 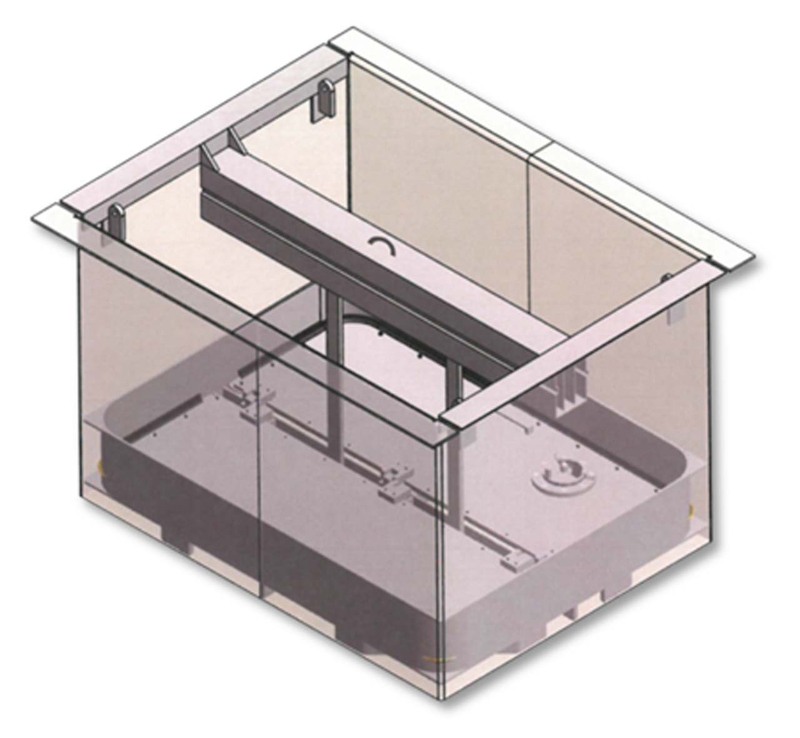 Flooding, which can short-circuit electronics, is never good for sensitive equipment. But seawater is particularly harmful, leaving behind salt that corrodes metal. 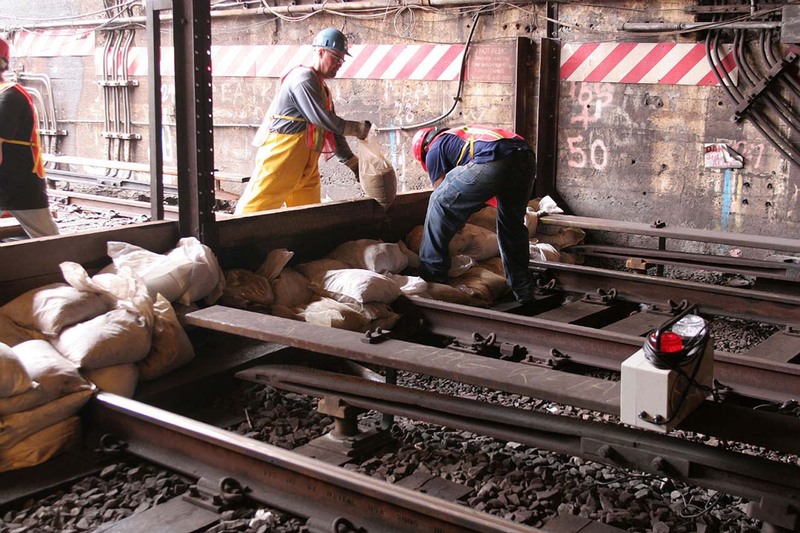 Salt also contaminates the grease used to cool elements of the subway’s signal system, leaving it prone to overheating. 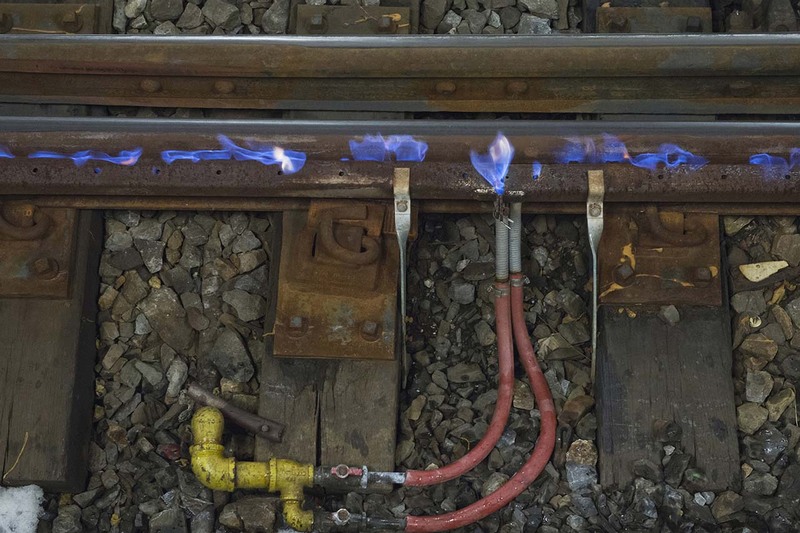 Electrical systems must work reliably to run trains safely. 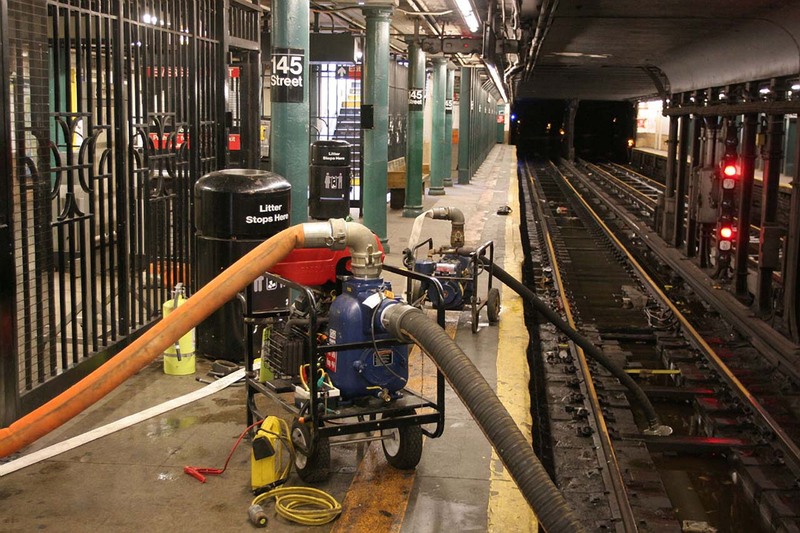 After Sandy, the MTA had to remove and thoroughly clean—or replace—thousands of pieces of equipment. This was further complicated by the age of New York’s transit system. Some equipment still in use is no longer manufactured, and no longer available. 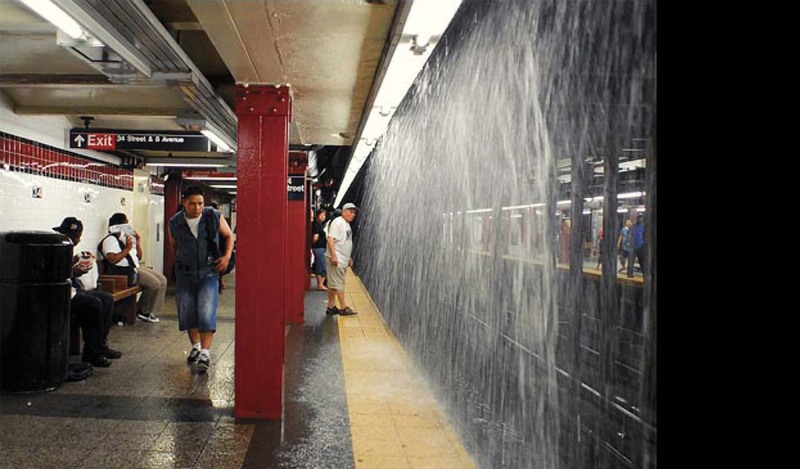 Transit workers couldn’t hold back the surging sea. But careful preparation did make it easier to restore service once skies cleared. It also saved millions of dollars worth of equipment—and probably saved lives. Nonetheless, recovery posed a monumental challenge. 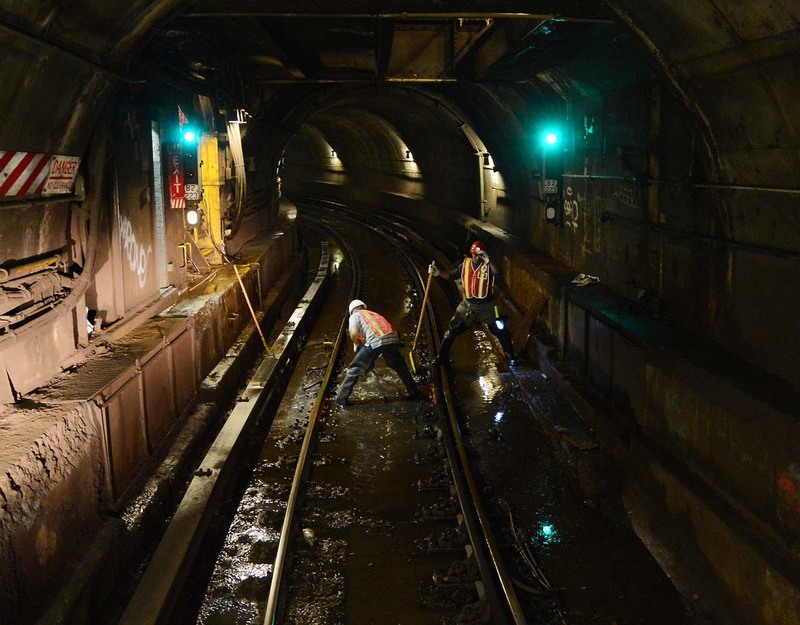 Crews pumped flooded tunnels, inspected and repaired miles of tracks, and replaced salt-corroded equipment. 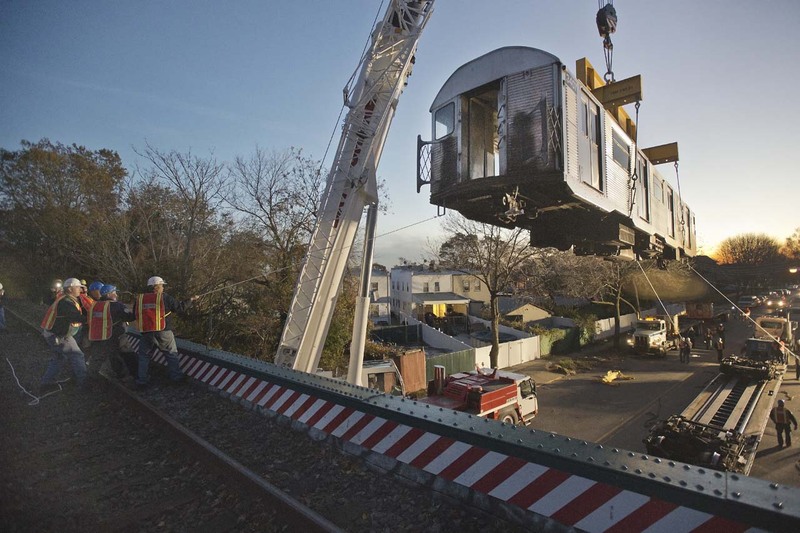 New York City Transit transported subway cars to the cut-off Rockaway Peninsula on flatbed trucks for a temporary shuttle. Regularly updated maps, social media, and web pages kept riders informed. Both staff and systems proved resilient. 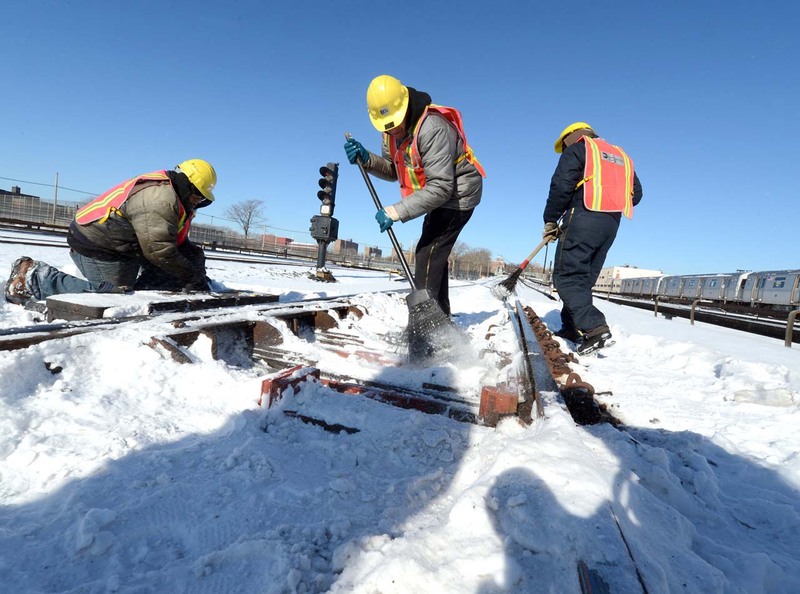 Within five days, 80% of subway service was restored, and most commuter rail west of the Hudson was running in a week. Subway tunnels. Railroad tunnels. Vehicular tunnels. 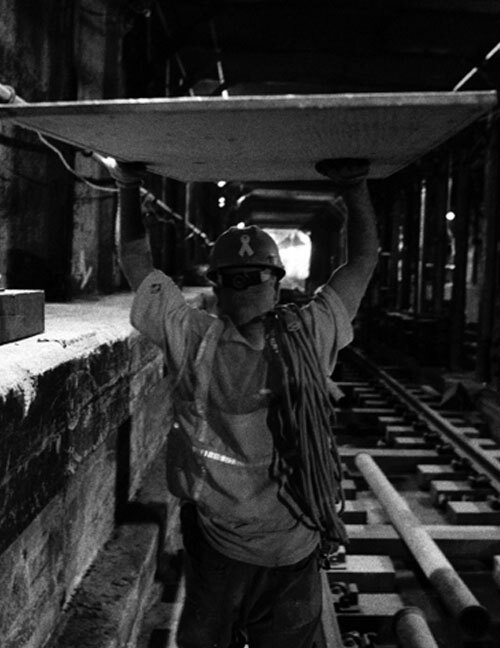 Many key parts of New York’s transportation infrastructure are underground. After Sandy, they were underwater. The scale of flooding was extraordinary. Seven million gallons of saltwater filled the 14th Street-Canarsie Subway Tube, and 27 million gallons flowed into the Montague Tube. Yet those numbers pale against the roughly 60 million gallons that flooded the Hugh L. Carey (formerly Brooklyn-Battery) Tunnel to the ceiling. 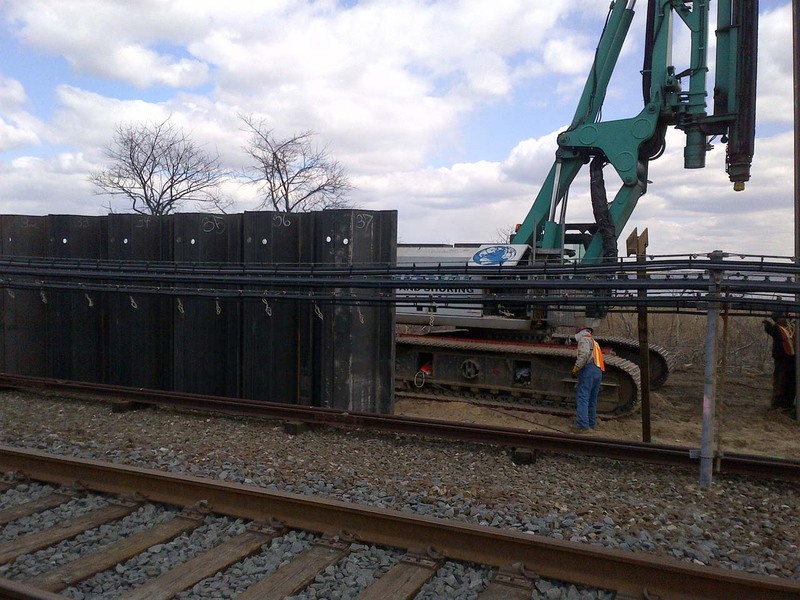 Despite power failures that complicated recovery, crews began “dewatering” operations almost immediately, using pump trains and a variety of mobile pumping devices. 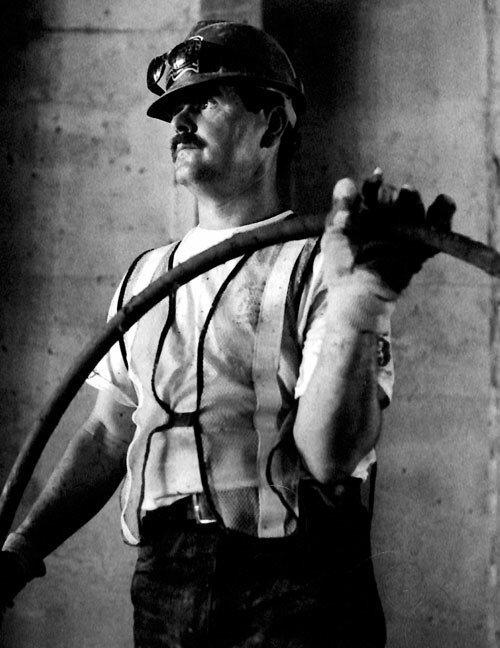 Emptying the Hugh L. Carey Tunnel took nine days, with 15 pumps averaging 3,320 gallons per minute. As life resumed post-Sandy, and people began to return to work and school, they wanted—and needed—timely transit information. Transit staff met around the clock to produce special maps that showed functioning subway lines in color, and others greyed out. 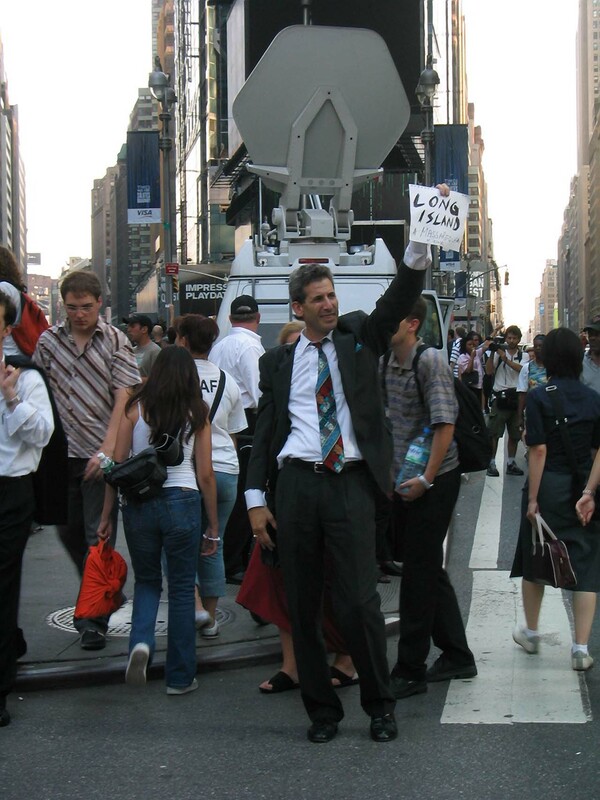 MTA communications personnel used every medium available to reach the broadest possible audience, from websites to television, radio, and social media. Letting residents see the destruction as it happened helped people understand the disruptions that followed. Subway and railroad tunnels under the East River help knit the city together, an essential transit link for millions of residents. But in Sandy’s wake, the flooded East River tunnels remained out of service. 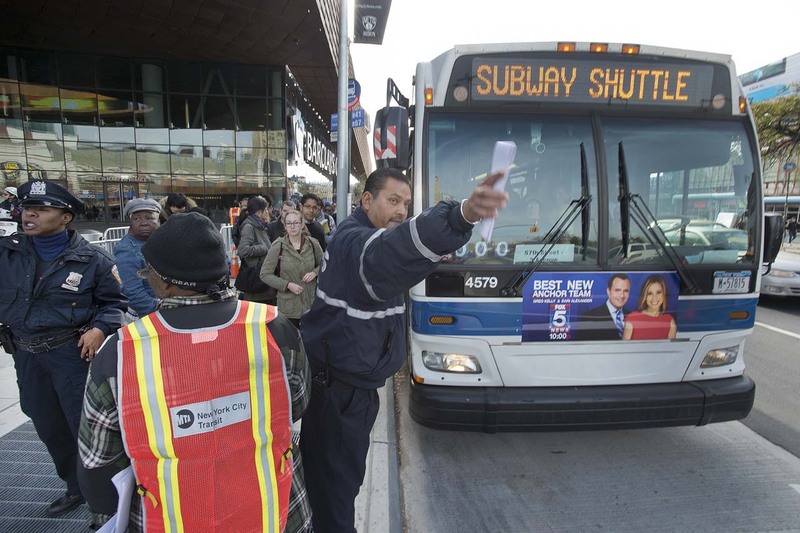 The MTA quickly assembled 330 buses and launched a temporary shuttle service for subway and LIRR riders, connecting the Barclays Center, MetroTech, and Hewes Street Stations in Brooklyn to Midtown Manhattan. Created on the fly, the Bus Bridge began with long lines. 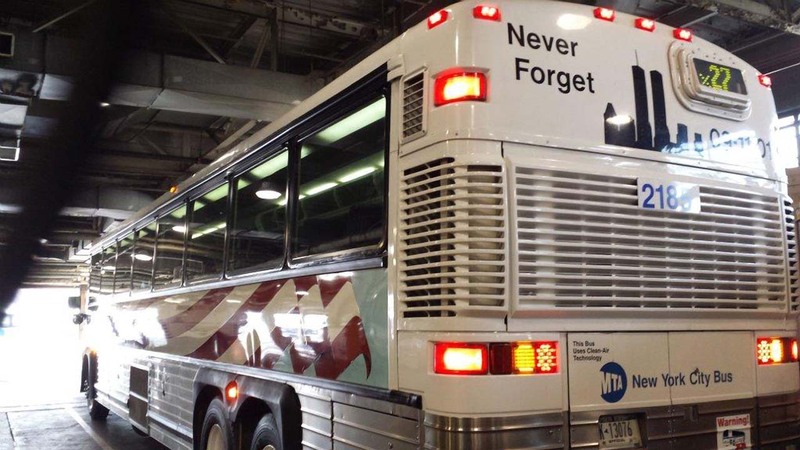 By Friday morning, however, buses were loading some 3,700 people per hour and taking them across the Manhattan and Williamsburg Bridges in dedicated lanes. 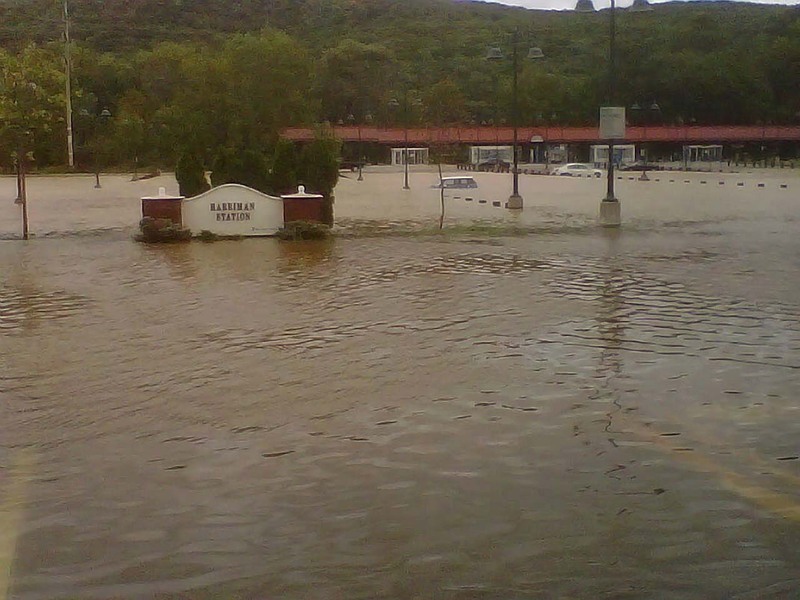 Even after the floodwaters subsided, numerous problems remained. Salt water inflicted severe damage. 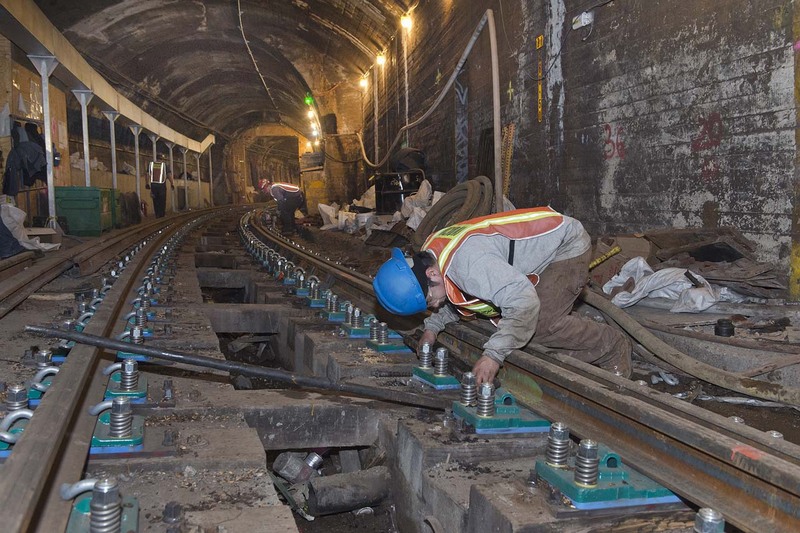 The Montague Tube, which carries the R train between Brooklyn Heights and Manhattan, was closed for 14 months as crews replaced corroded equipment, an operation that MTA Chairman Thomas Prendergast called “the closest thing to building a new under-river tube.” It took six months to repair the A train’s Rockaway line, rehabilitating two stations and replacing washed out tracks and miles of signal, power, and communications wires. 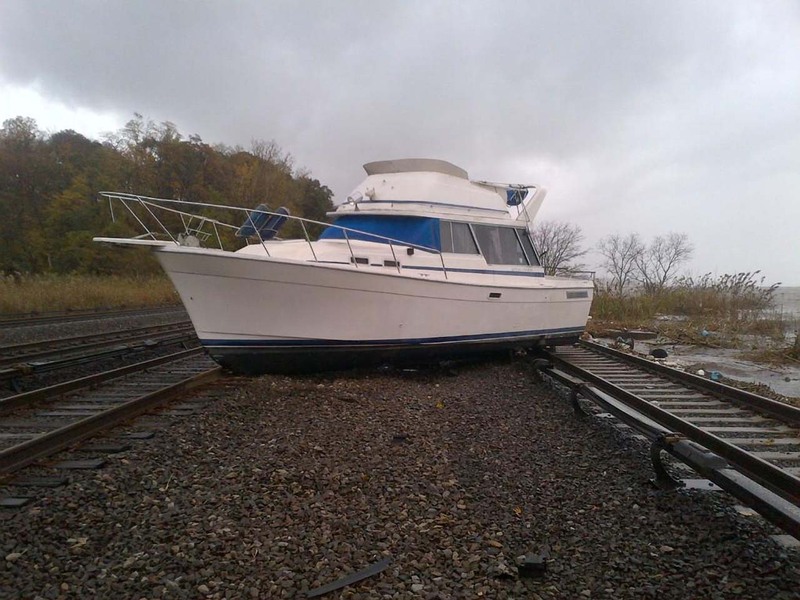 On Long Island, even after workers removed 600 downed trees and utility poles, 12 boats, and other items from LIRR tracks, signals and power equipment still needed extensive repair. 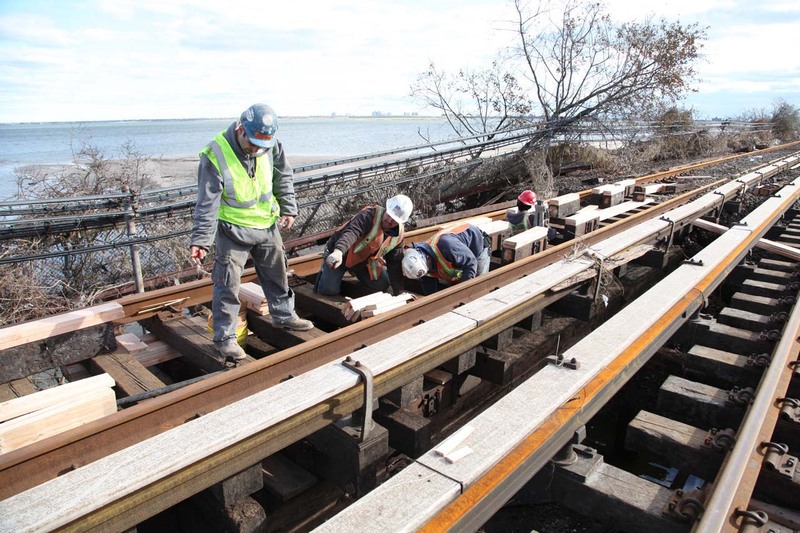 Sandy destroyed tracks and signals on the Broad Channel Bridge—cutting off the Rockaways. The MTA, determined to restore the entire transit network, devised a novel solution to reconnect the neighborhood. 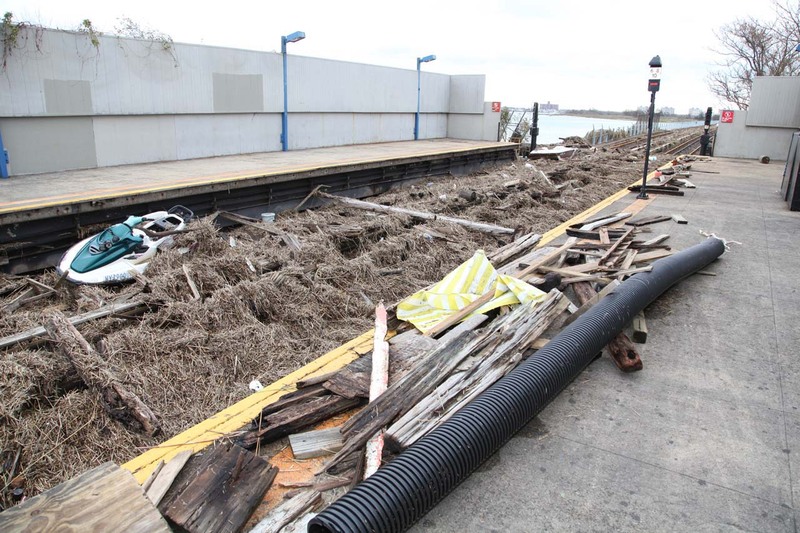 On November 11, 2012, A train service to Howard Beach resumed, and free shuttle buses took passengers from there to the Far Rockaway/Mott Avenue station. To restore service within the Rockaway peninsula, a fleet of flatbed trucks brought 20 subway cars from Ozone Park, Queens, to the Rockaways. Running on previously unused tracks, they became the temporary “H train” shuttle, linking the Far Rockaway/Mott Avenue and Beach 90th Street Stations. Surviving Sandy doesn’t mean we can now relax. With a warming climate likely to raise sea levels and generate more extreme weather, superstorms may not be once-in-a-lifetime occurrences. 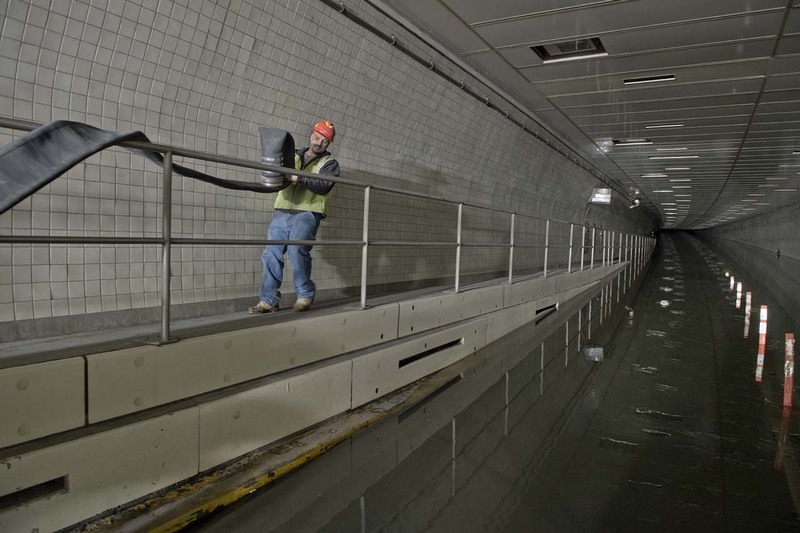 Looking ahead, MTA engineers, policy makers, and emergency planners must find new ways to keep water out of the system—and more efficient ways of getting the water out when it does get in. The goal is a transit system able to withstand threats like those we’ve seen—and resilient enough to recover from those we haven’t. 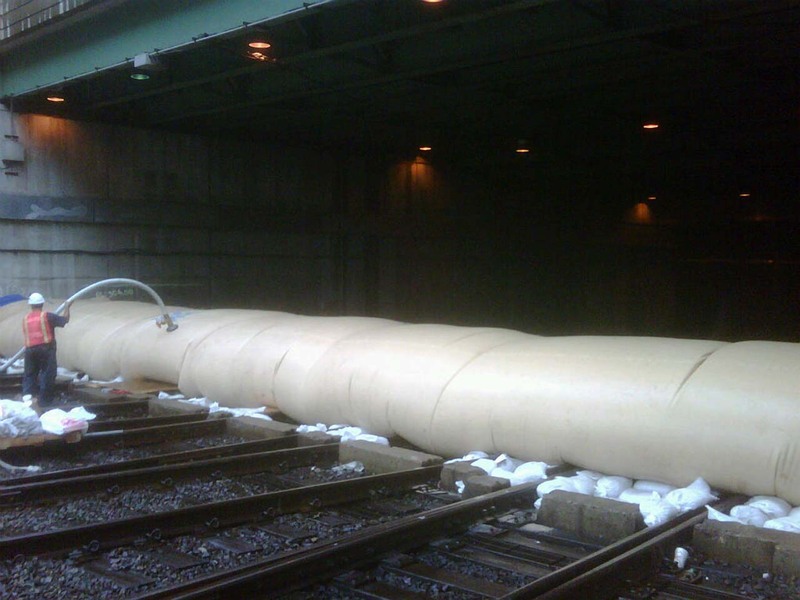 With the lessons of Superstorm Sandy still fresh, MTA engineers are designing and testing new ways to keep the water out. 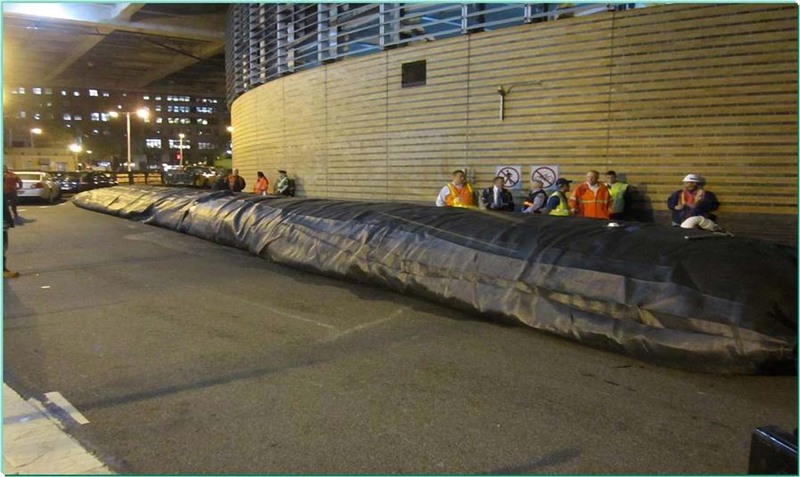 These include long-term and short-term, high-tech and low-tech solutions—from watertight vent covers to inflatable coffer dams. One challenge is to devise measures that work equally well in crises and normal situations. For instance, how do you make underground stations and tunnels watertight when there is flooding, yet keep them open to people, trains, cars, and fresh air the rest of the time? 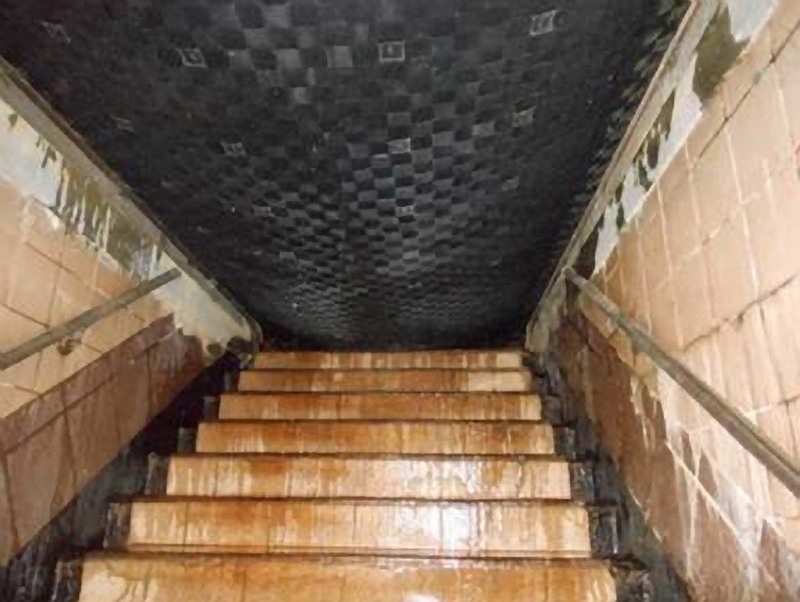 Coming up with the right solution for each stairway, vent, tunnel, and facility requires a subtle mix of engineering, design, art, and science. 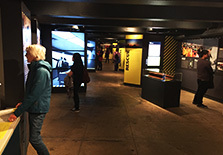 New York Transit Museum exhibits and programs are supported, in part, by public funds from the New York City Department of Cultural Affairs in partnership with the City Council, and by the New York State Council on the Arts with the support of Governor Andrew Cuomo and the New York State Legislature.